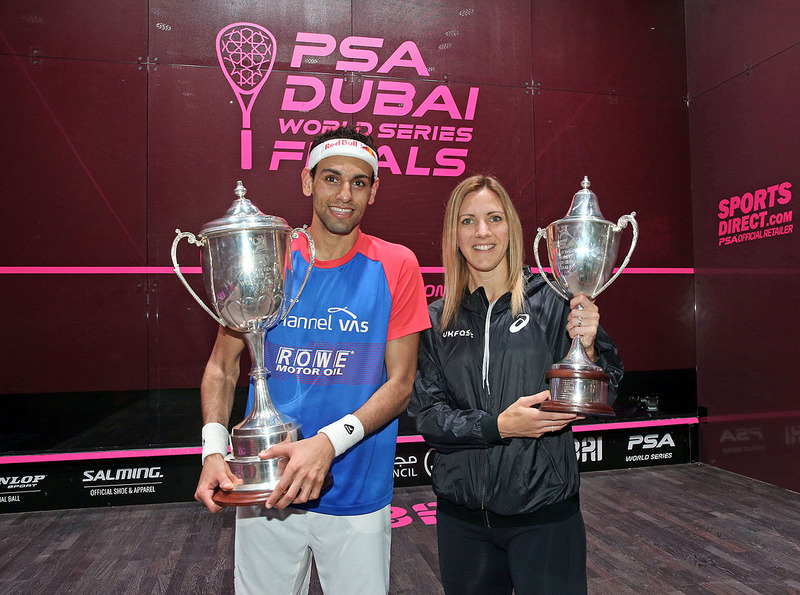 Egypt’s Mohamed ElShorbagy and defending champion Laura Massaro claimed the Men’s and Women’s titles, respectively, at the 2016/17 PSA Dubai World Series Finals after prevailing in their final clashes inside the stunning Dubai Opera. 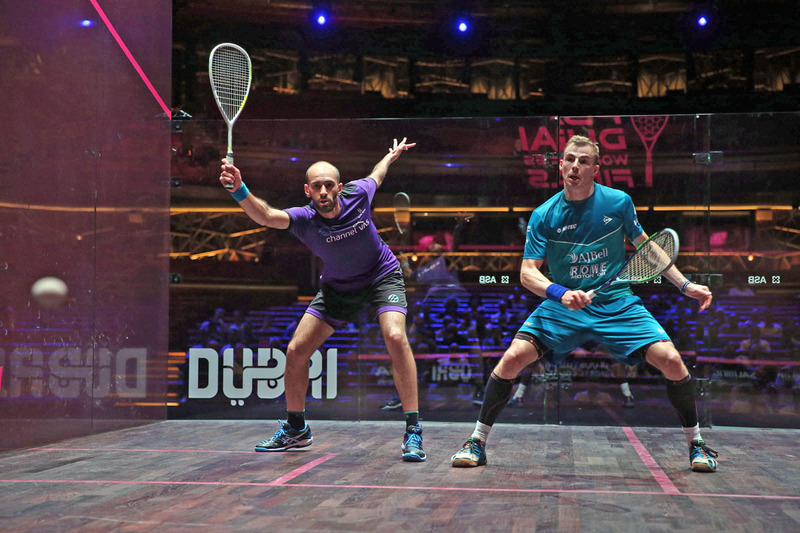 The World Series Finals is the first sporting event ever to take place in Dubai Opera and sees ElShorbagy and Massaro claim over $40,000 each after respective wins over England’s former World No.1 James Willstrop and Egyptian World Champion Nour El Sherbini. 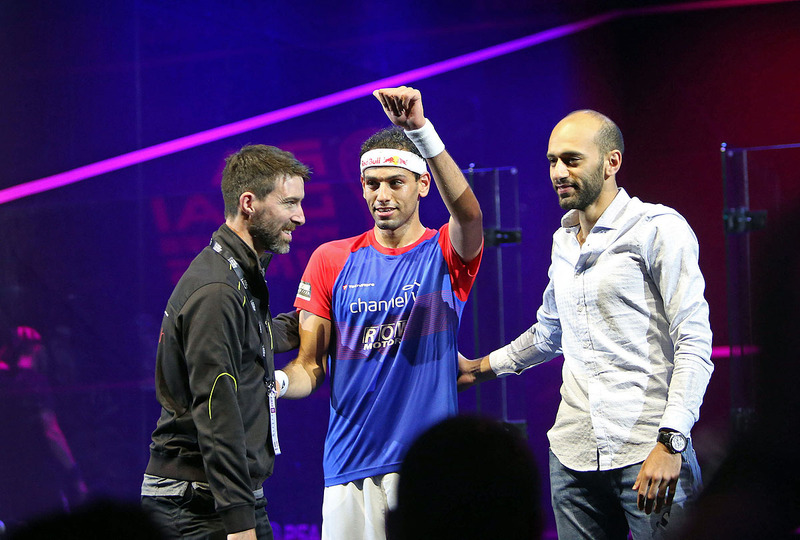 ElShorbagy ended a difficult season on a high to lift his first ever World Series Finals crown and his first Tour title since November after beating Willstrop by an 12-10, 11-9, 11-8 in 57 minutes. 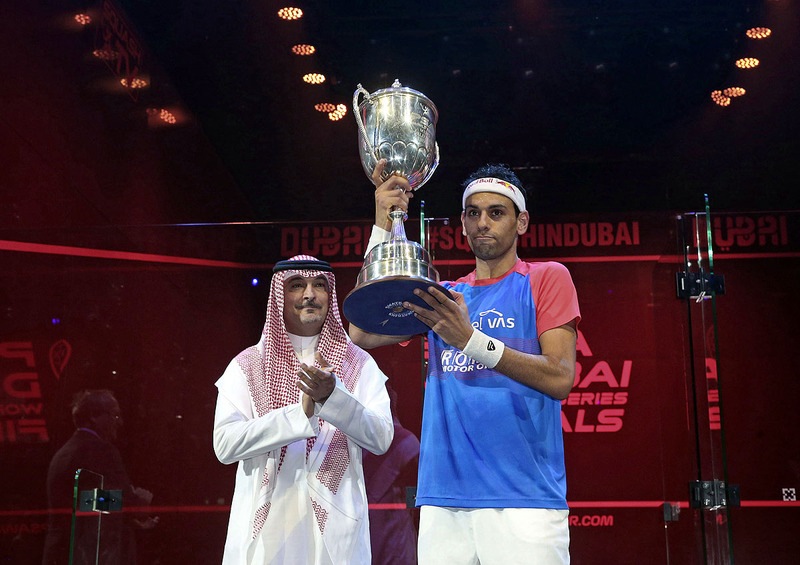 "To win this tournament has been a dream for so long," said ElShorbagy after lifting his 25th Tour title. "It’s a very emotional win. I lost some confidence in myself during the season but I feel like I bounced back this week. "I don't want to lose. I hate losing. This season I didn't play with my spirit, but I'm really proud I got that back this week. 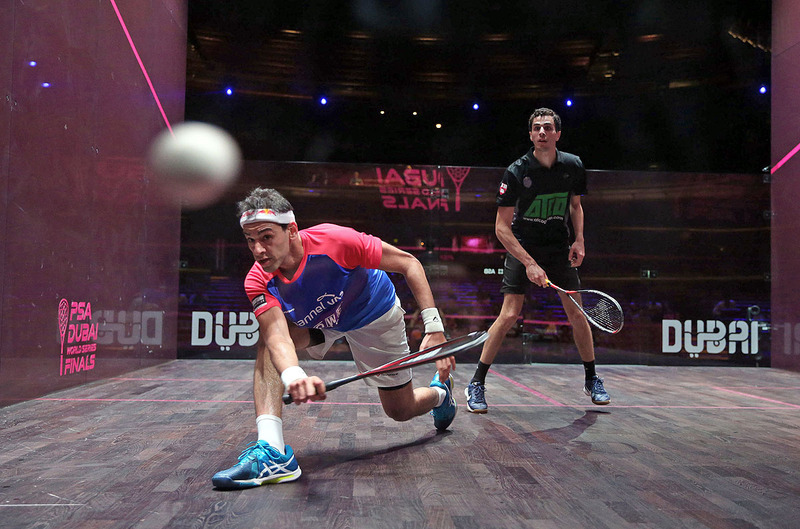 It was my best squash since being World No.1." 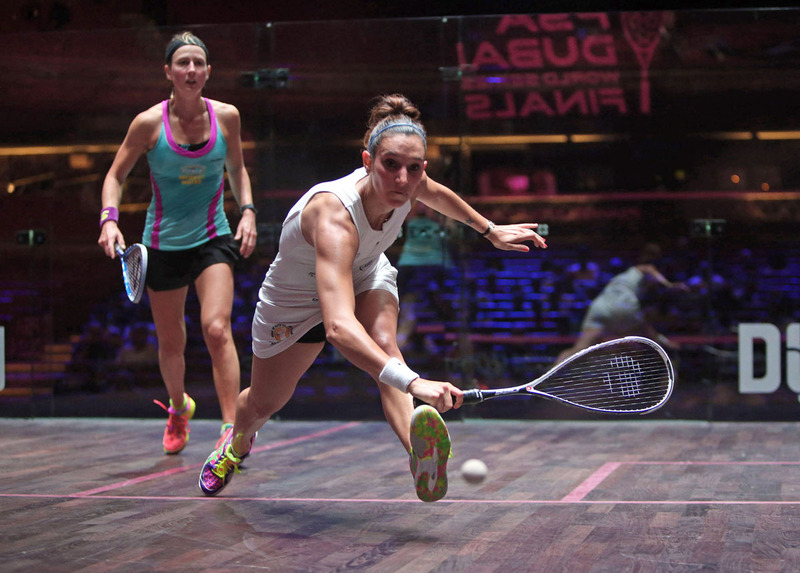 Meanwhile, Massaro has become only the second woman ever after Malaysian legend Nicol David to win two World Series Finals titles after she overcame El Sherbini in straight games. 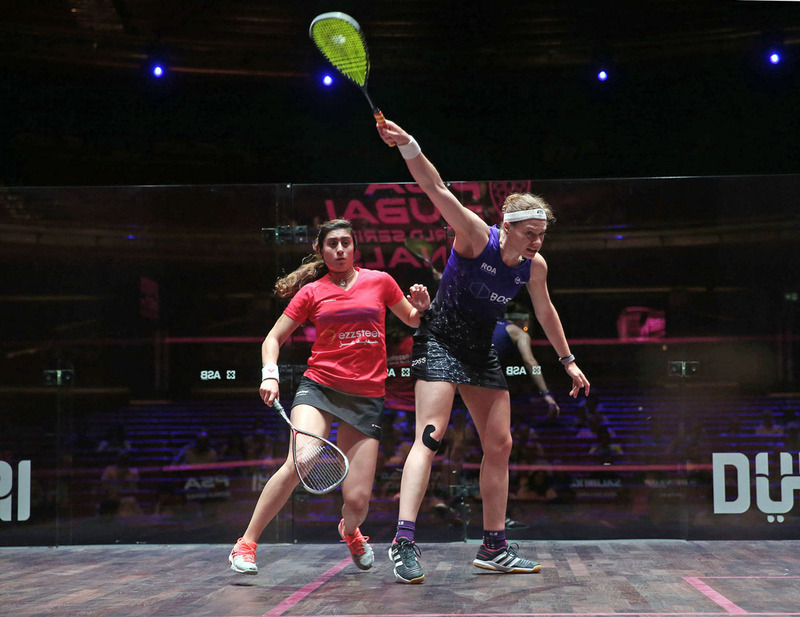 The pair had met earlier on in the tournament - with El Sherbini winning the best-of-three games contest to qualify second in Group B - but in the best-of-five games final, it was Massaro who emerged the victor after claiming an 11-8, 12-10, 11-5 victory to capture her 22nd Tour crown. "I’m really happy with my performance overall," said Massaro. "It took a lot of focus, discipline, hard work and I had to keep pushing throughout the whole match. The first two games were really tight and I managed to get that good lead in the third. "I’m one of the oldest ones on Tour now and as long as I feel as though I’m still in contention to win titles then I’m happy. To be able to win the British Open, to reach the final of the ToC [Tournament of Champions] and to win here really makes me think that I’m still in contention and I can still win titles." 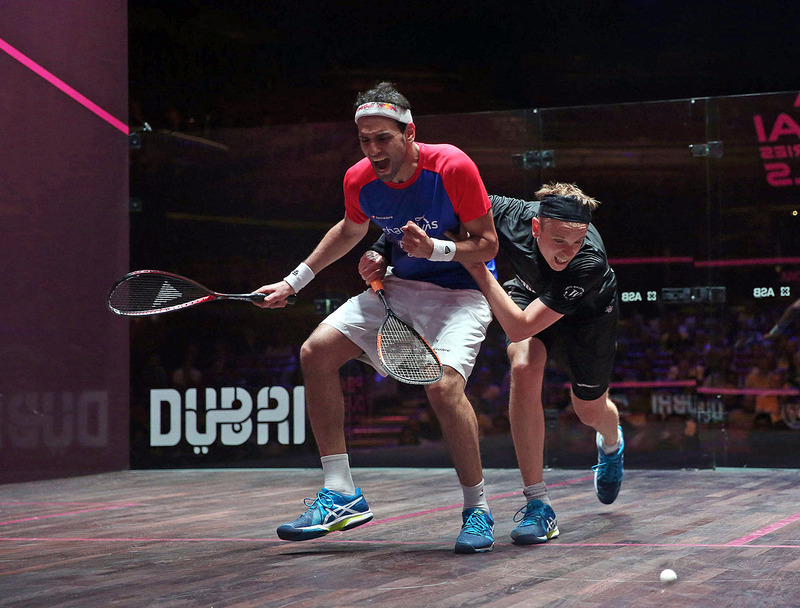 The World Series Finals brought together the top eight players on the Men’s and Women’s PSA Road to Dubai Standings who were then split into two groups of four, with matches played in a best-of-three games format. Players then battled for points to qualify for the knockout semi-finals and beyond, while the final was contested in the regular best-of-five games format. "I’m 33, I’ve had time out like a few of us have, but I’m not taking it for granted that I’ll be able to get back to where I was when I was 29, it’s not that simple," said Willstrop. "So it’s a great feeling when you’ve kept pushing yourself and you’ve gone down to No.20 in the world. To be able to do it again and to do it over four days means you’re still there and it’s a big confidence booster. "Before I qualified I wanted to be here desperately and there are all sorts of motivations here. Once I got there I was really focused on it. I had other tournaments to play, but this was the big finale and I’ve eyed it up certainly." 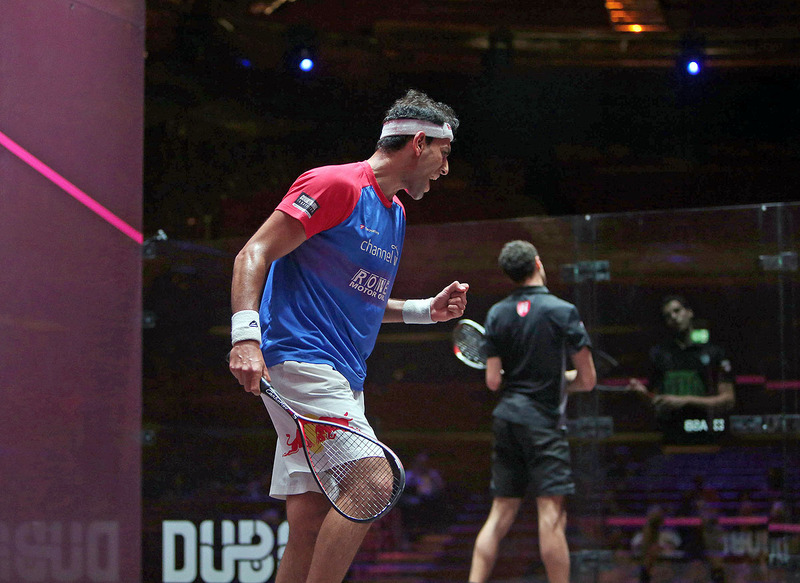 “I’m born for these kind of matches and these kind of moments and I don’t accept myself being in another position," said ElShorbagy. 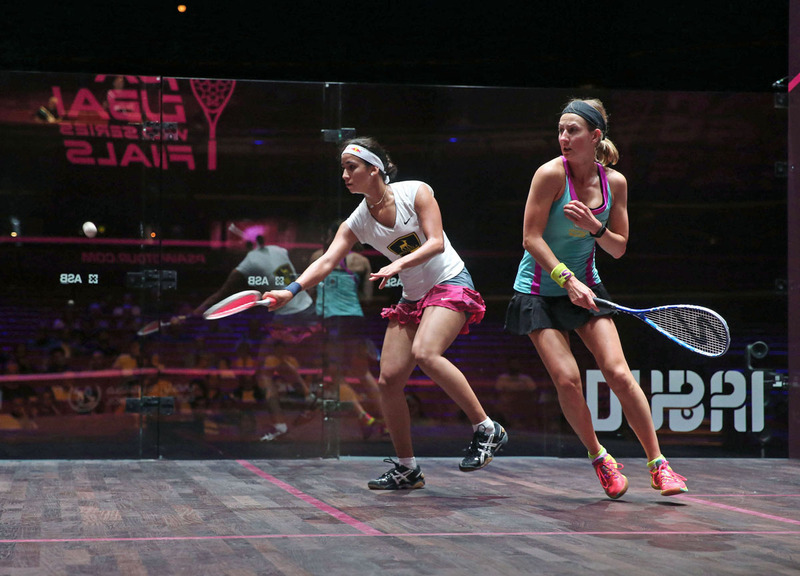 Elsewhere, Massaro and El Sherbini set up a repeat of the 2015 PSA Women’s World Championship final after they achieved respective victories over Nouran Gohar and Camille Serme. 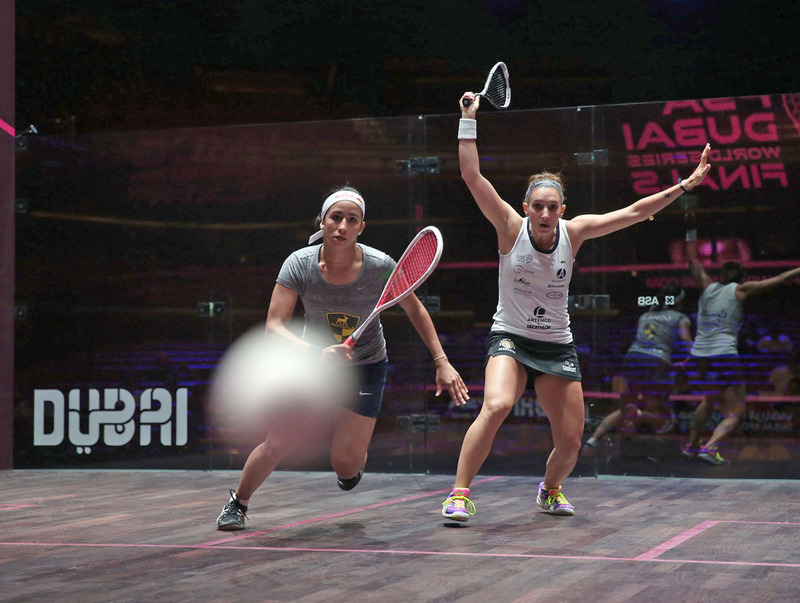 "Saving two match balls is brilliant and I’m really proud of myself, but I’m also really annoyed that I let three game balls in the first go," Massaro said. "I just need to let it sink in, but I’m really happy to be through for tomorrow." 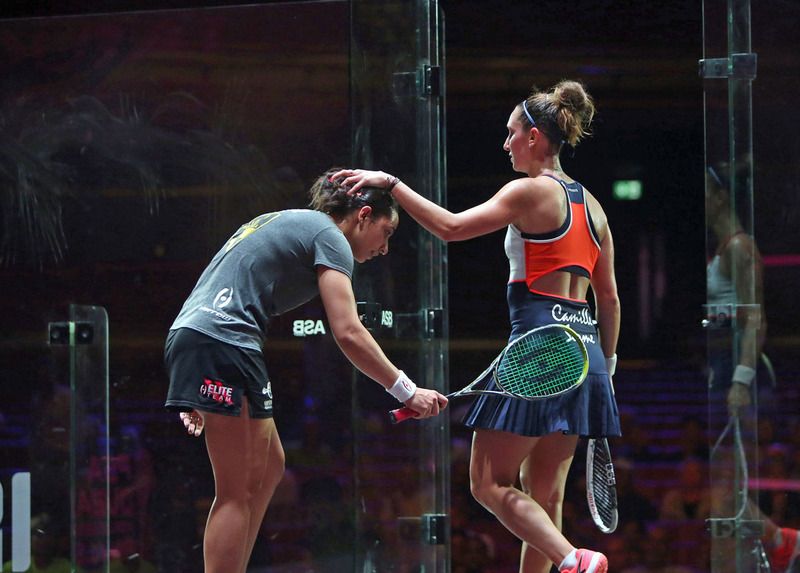 "I thought that I was going to retire from the match because I couldn’t hold the racket,” said El Sherbini. “But I thought that I should go on and try and I think that it’s the reason I won. Because of my hand I was just thinking that I wanted to finish the points, so I attacked on every point and every opportunity." 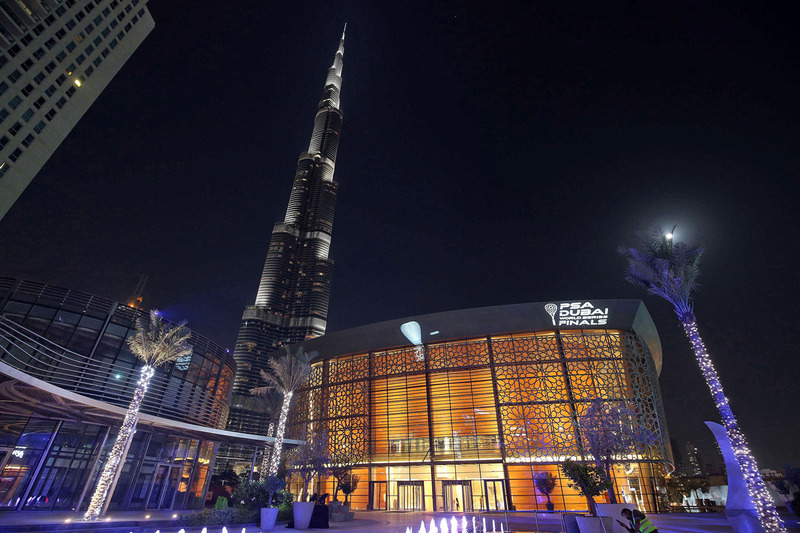 The group stage of the 2016/17 PSA Dubai World Series Finals drew to a close on day three of the season-ending tournament taking place in the stunning Dubai Opera as World Champion Karim Abdel Gawad, former World No.1 James Willstrop and Germany’s Simon Rösner all joined World No.3 Mohamed ElShorbagy in the semi-finals of the Men’s event. 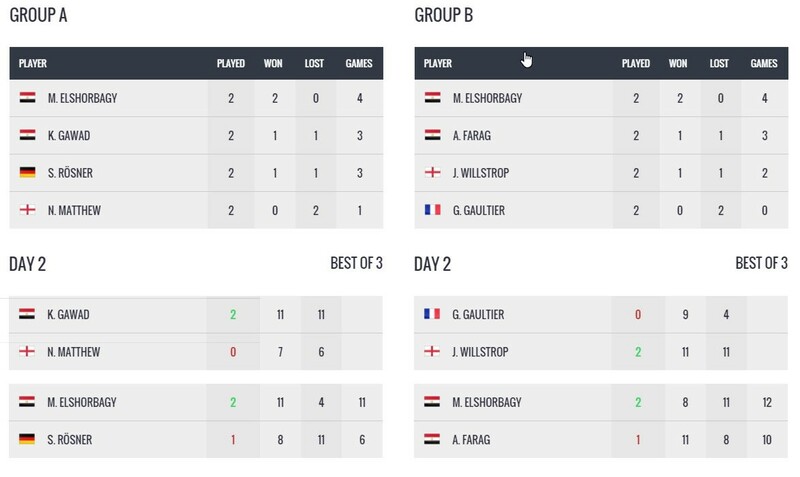 Gawad began the tournament with a defeat to Rösner, but qualifies top of Group A after following up a day two win over 2010 finalist Nick Matthew with victory over compatriot Marwan ElShorbagy, which sees the World No.1 go ahead of Rösner in the group due to a higher games won percentage. 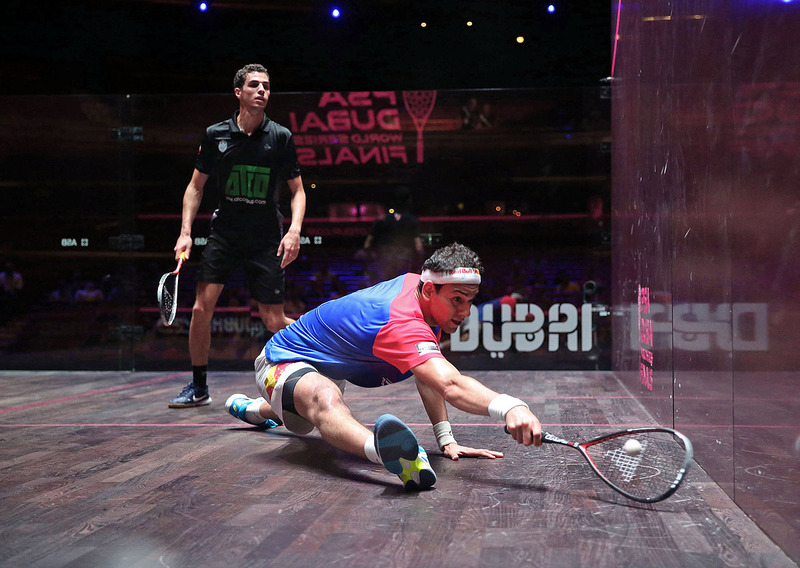 “I didn’t have the best start to the tournament,” admitted Gawad. “I would say it’s the first time on court where I got too excited and didn’t start the right way. I had no pressure on me afterwards and I just wanted to enjoy playing in such a great venue. “I just wanted to be on court as much as I could. I didn’t expect to get to the semi-finals, especially at the top of the group. 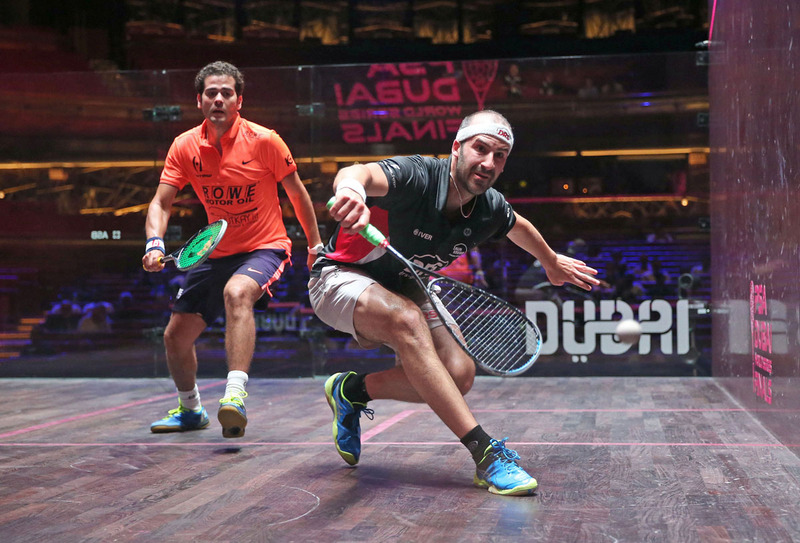 Playing here is an unforgettable experience, you don’t have the chance to play at this venue everyday and it’s great for our sport, we need more of these kinds of tournaments." 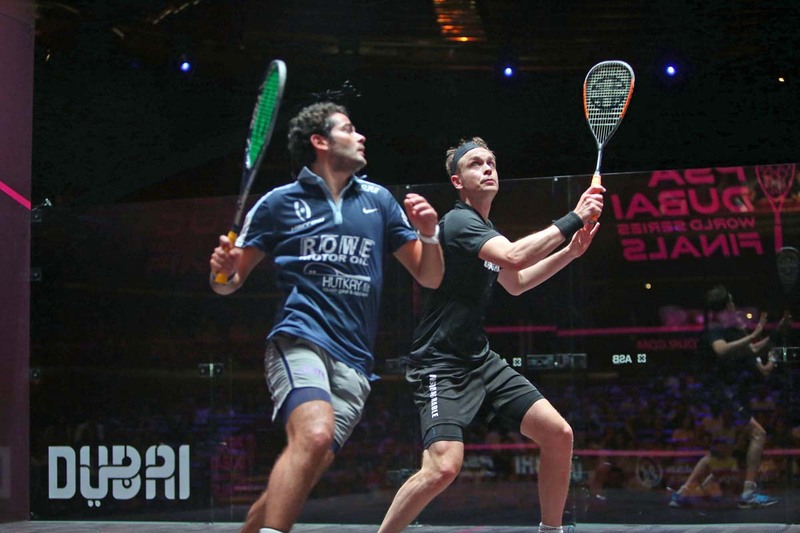 World Series Finals debutant Gawad will clash with Willstrop for a place in the final after the 33-year-old Englishman held off World No.5 Ali Farag to reach the last four for the first time since the 2012 edition. 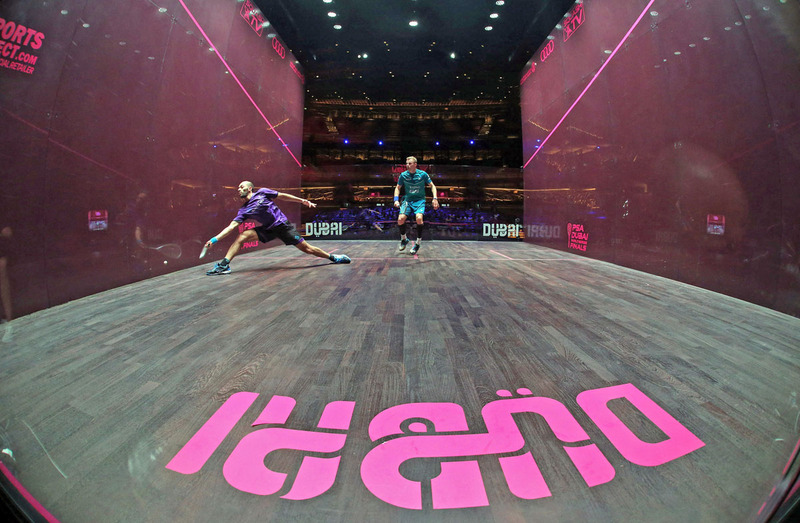 With one win and one defeat under his belt, 33-year-old Willstrop needed to beat Farag to reach the last four, but was under cosh from the first point as an inspired Farag surged to victory in the opening game. Willstrop weathered the storm though in the second game to edge out an 11-9 victory and he closed out game three for the loss of six points to seal second place in Group B. 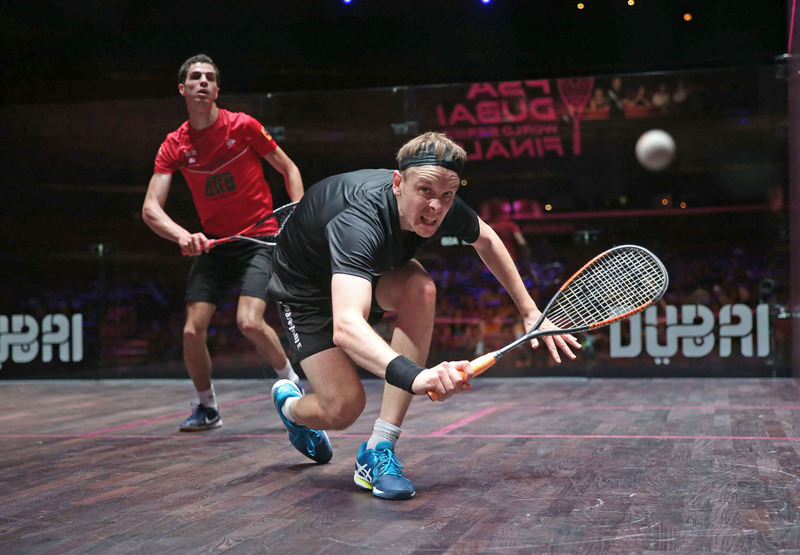 "People throw it around when they say that someone can become World No.1 and it doesn’t happen that easily, but Ali’s an awesome squash player and a credit to the game as well," said Willstrop. "I didn’t think I did too badly really, he was just so good. It was maybe a little bit short when I was hitting to the back and I thought that all I could do at the start was to stay in it. I had to have a bit of faith that, despite the fact it’s gone wrong on the scoreboard, I could turn it around. "You’ve got to regroup and you can’t let it get to you mentally. I thought that I just had to win the two games, it’s as simple as that." 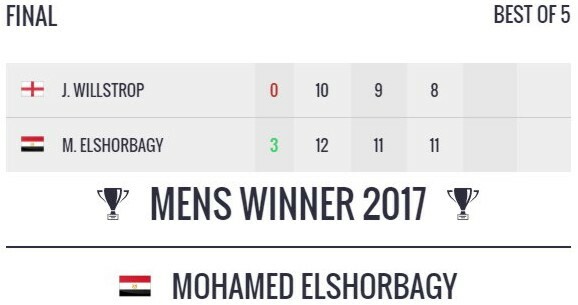 World No.3 Mohamed ElShorbagy topped Group B ahead of Willstrop and is the only man to maintain a 100 per cent record after he dispatched defending champion Gregory Gaultier 2-0 to leave the Frenchman without a win. 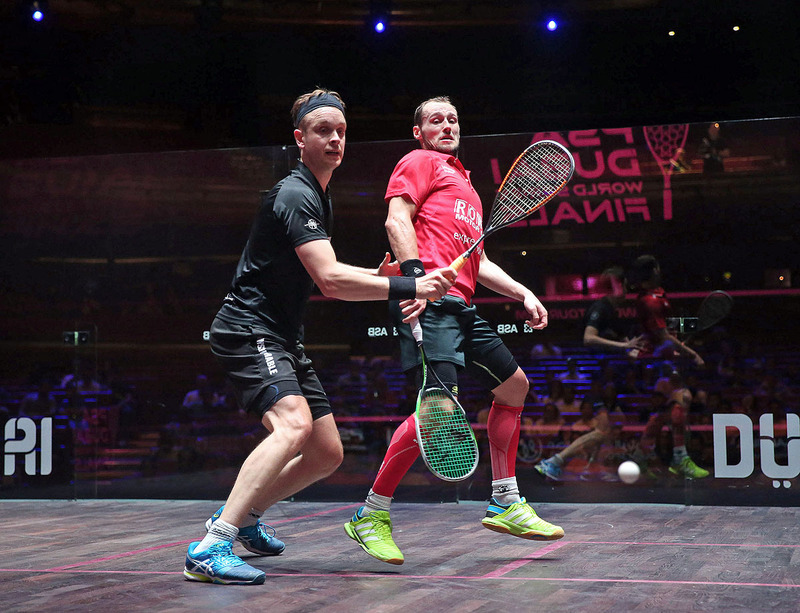 He will face Rösner after the World No.11 beat 2010 finalist Nick Matthew to become the first German ever to reach the semi-final stage of the World Series Finals. 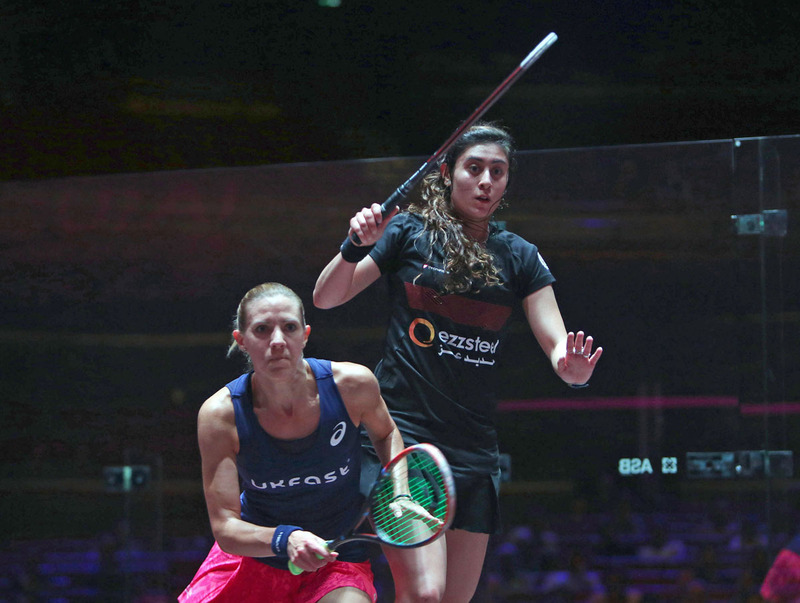 The Women’s event saw World Champion Nour El Sherbini earn her place in the knockout stages at the expense of England’s Sarah-Jane Perry after she recovered from a game down to beat last year’s winner Laura Massaro. 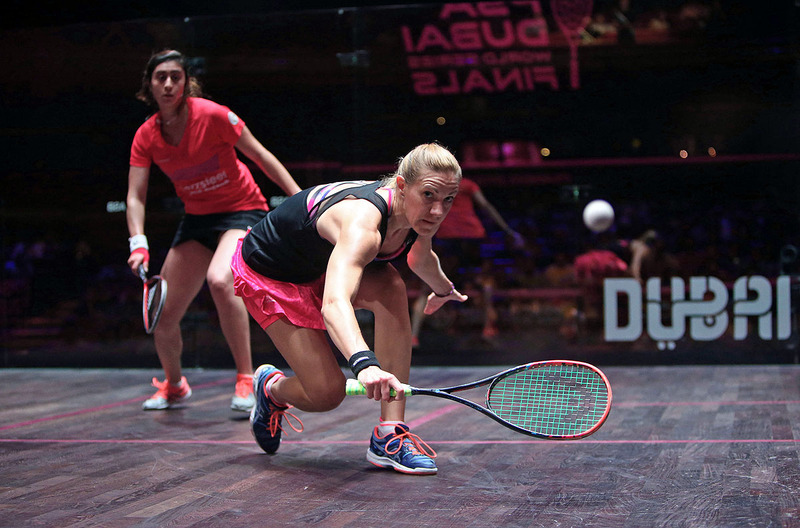 Massaro was 1-0 up and match ball up in the second game until a spirited fightback from El Sherbini saw the Egyptian World No.1 turn the match on its head to triumph, meaning that she finishes second in Group B behind Massaro due to the Englishwoman’s superior games won percentage. 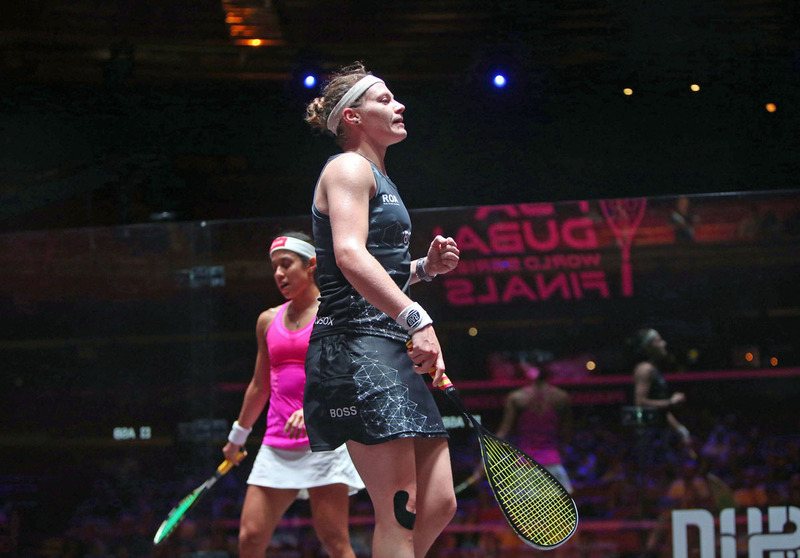 El Sherbini’s games won percentage is higher than that of Perry’s, which means Perry’s 2-1 win over two-time winner Nicol David wasn’t enough to make it an English triumvirate in the semi-finals. 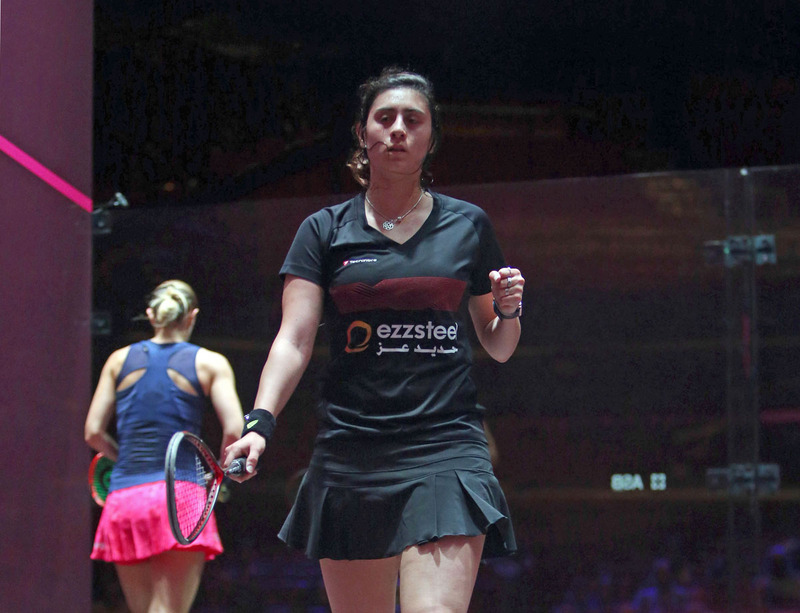 “I wanted to qualify so badly and last time I played Laura I was 2-0 up [before losing],” said El Sherbini. “It wasn’t going my way in the first game, but I’m really happy to qualify. I feel sorry for SJ though, I know how it feels not to qualify for the semi-finals." 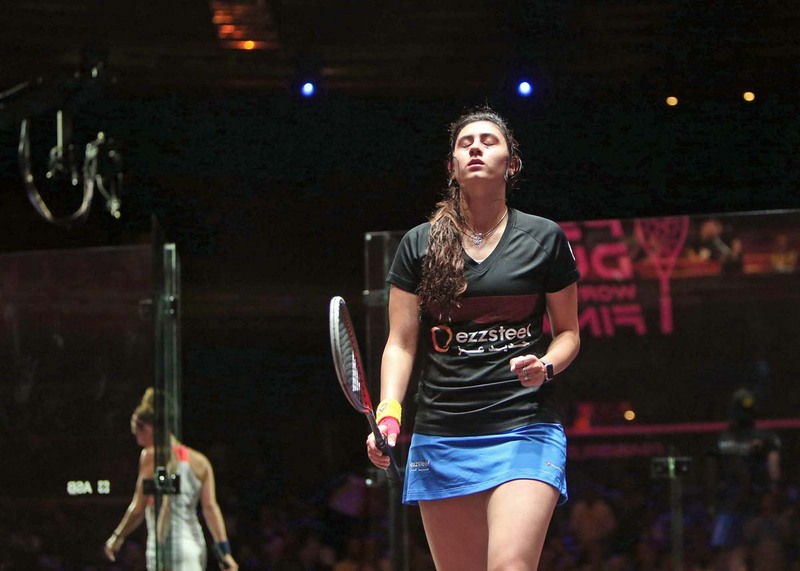 El Sherbini will go up against French World No.3 Camille Serme, who is the only female player to hold a 100 per cent record after she beat World Championship runner-up Raneem El Welily to make it three wins out of three. 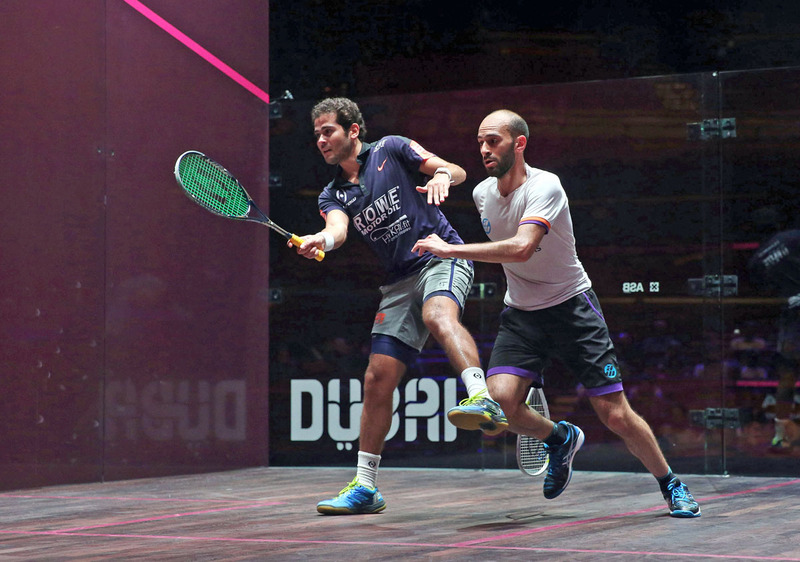 It was a straight shootout between the pair to decide who would qualify from Group A and El Welily held two game balls in the third game, only to see Serme show nerves of steel to take four successive points to send El Welily out. "I can barely realise that I’ve made it,” said Serme. “You can count on one hand the times I’ve beaten her, so I’ll take this one. It could have gone either way, it was so close and I had a different tactical plan from yesterday. I tried to fight as much as I could and tried to retrieve every ball." World Junior Champion Nouran Gohar is the other player from Group A to make it through to the last four after she overcame England’s Alison Waters and she will face off against Massaro. 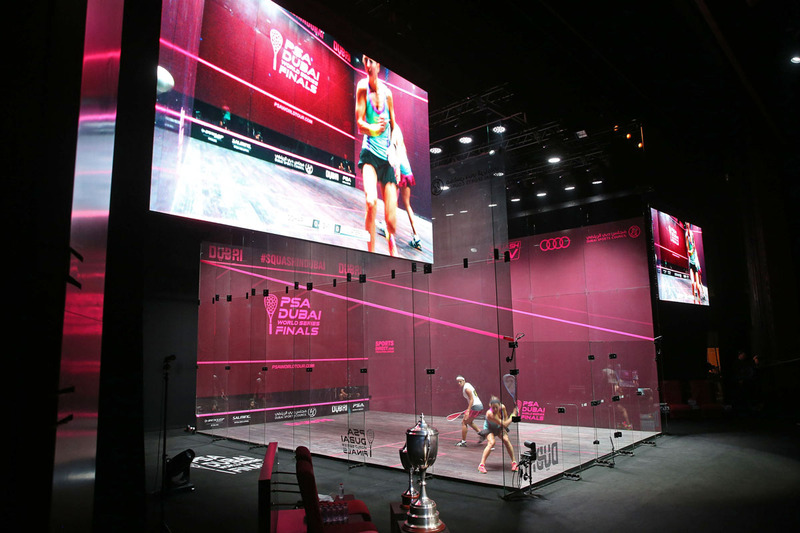 The World Series Finals brings together the top eight players on the Men’s and Women’s PSA Road to Dubai Standings who are then split into two groups of four, with matches played in a best-of-three games format. 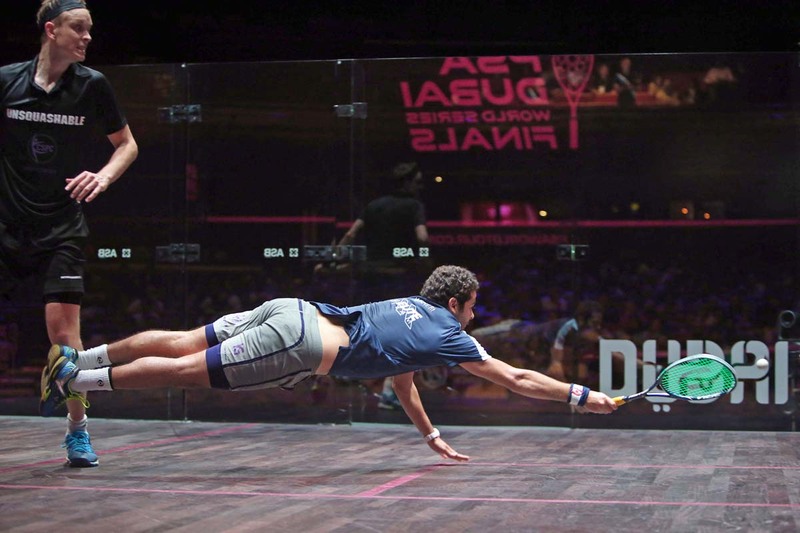 Players then battle for points to qualify for the knockout semi-finals and beyond. 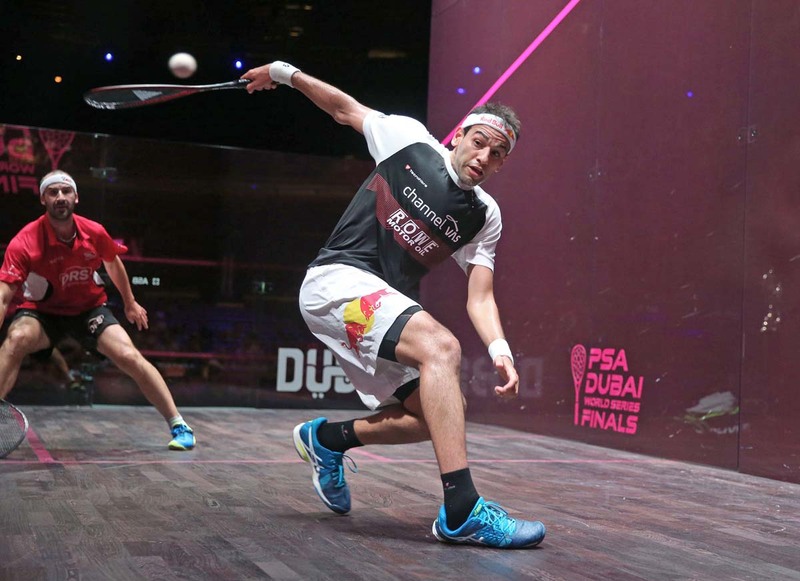 World No.3 Mohamed ElShorbagy sealed his place in the last four of the Men’s 2016/17 PSA Dubai World Series Finals after the Egyptian beat compatriot Ali Farag on day two in Dubai Opera - meaning last year’s champion Gregory Gaultier crashes out at the group stage. 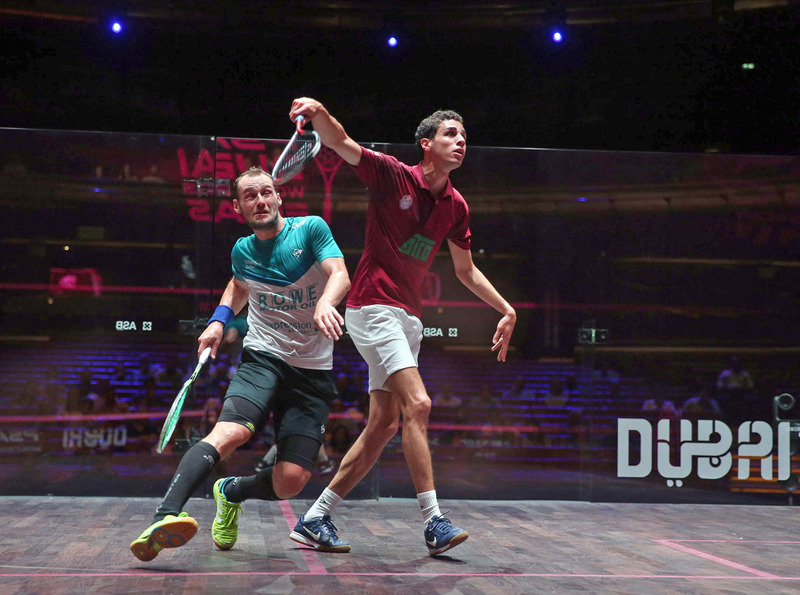 ElShorbagy followed up an opening day win over former World No.1 James Willstrop with a dramatic victory over Farag, taking it 12-10 in the third-game tie-break to seal qualification from Group B. 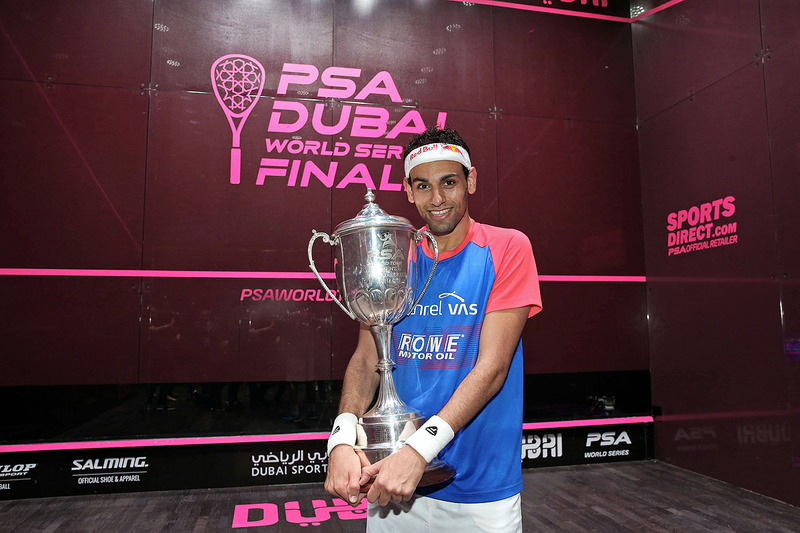 "I’m happy that I won using my own strengths, which is something I did when I was World No.1," said ElShorbagy. "I was challenged, but I threw myself into that challenge and being 1-0 down and one game away from losing the match was tough mentally. When I was at my best that’s what I was good at and that’s what made me different from other players because I could get through those kind of situations. "We had some issues in the first two matches we played in the season, in Al Ahram and the World Championship, but it felt like we both got that anger out of each other. Since those two matches we started to have so much respect for each other." Gaultier, meanwhile, has failed to make it to the semi-finals for the first time in his career after he lost to Willstrop in straight games. Gaultier, the current World No.1, had only lost once in 2017 prior to the tournament and had won 27 matches in a row, in addition to claiming six successive Tour titles. 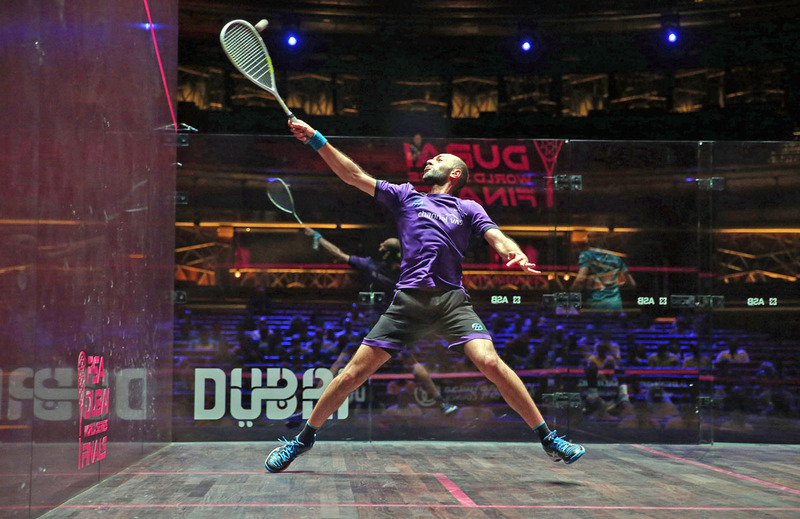 However, the heavy schedule looks to have caught up with him in Dubai after he slumped to a defeat to Willstrop which, added to his first round loss to Farag, means that he is yet to win a game. "If you get a result over Greg then something is clearly going well," said Willstrop. "Nobody is beating him at the minute and it’s difficult for me not to point out that he’s had a tough season. "I know how difficult it is mentally to have to get yourself up for every tournament for a whole season." 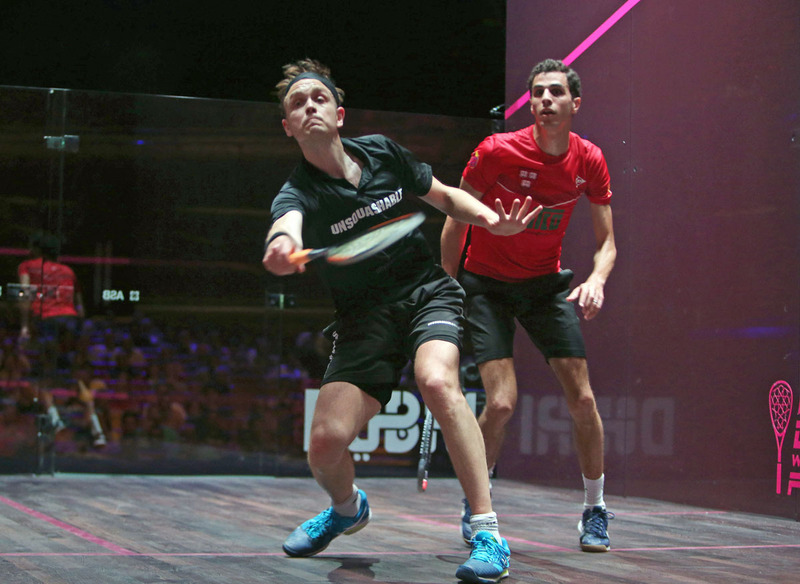 Willstrop and Farag will clash next to decide who joins ElShorbagy in the semi-finals, while Willstrop’s compatriot, Nick Matthew, is on the brink of elimination from Group A after he slipped to a 2-0 defeat to World Champion Karim Abdel Gawad. 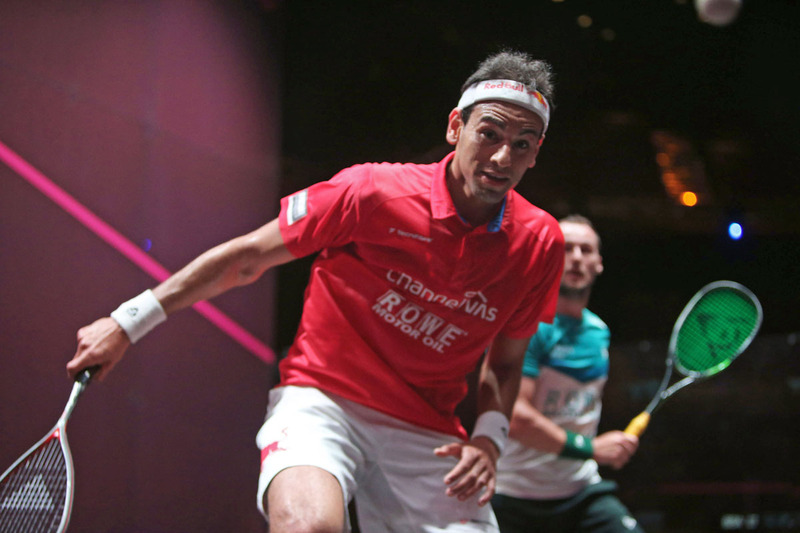 Egypt’s Marwan ElShorbagy defeated Germany’s Simon Rösner to go top of Group A, which means Matthew must now beat Rösner 2-0 in his final match while hoping that Marwan beats Gawad 2-0 to have any hope of reaching the semi-finals, with the percentage of points won being the next qualification criteria. 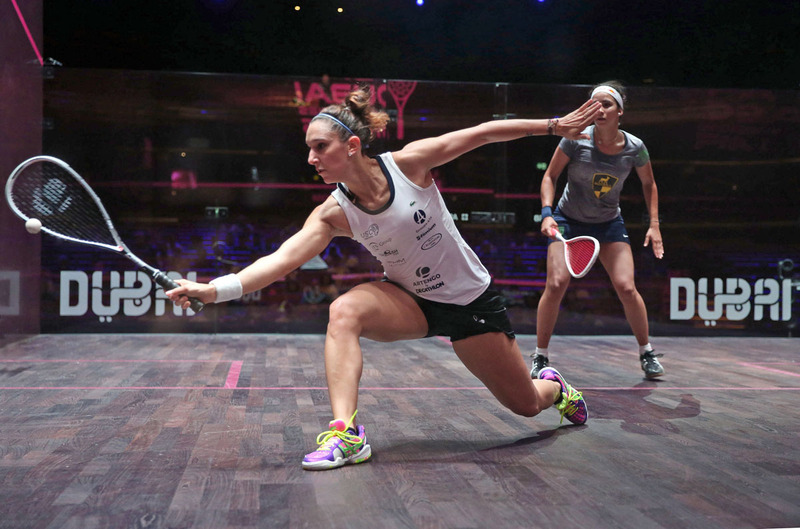 A confident display from Massaro saw her follow up her opening day win over two-time winner Nicol David to take the opening game before overturning five game balls in the second to seal the victory by an 11-6, 14-12 scoreline. 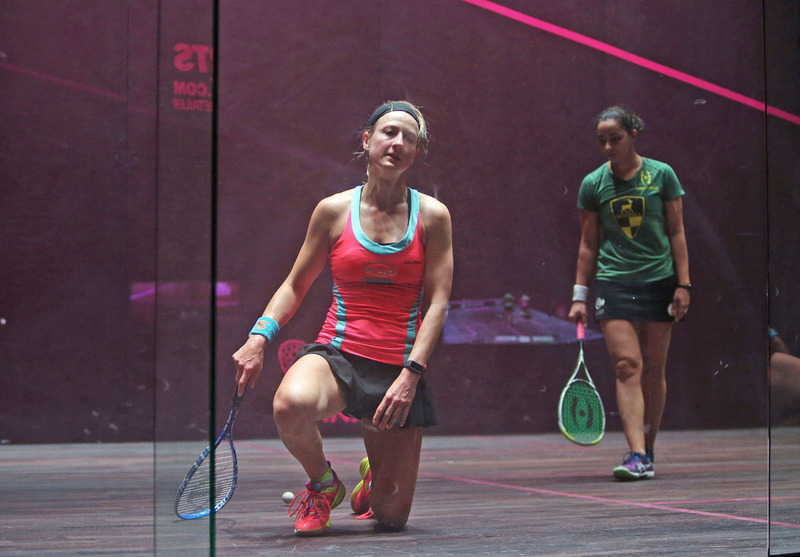 "I’m really happy, maybe it’s better that I need to go in and get a result tomorrow," said Massaro. "I’ll still want to win tomorrow regardless of whether I’m qualified or not. It’s great to know that I’m in the semi-finals, but there’s still a job to do tomorrow." 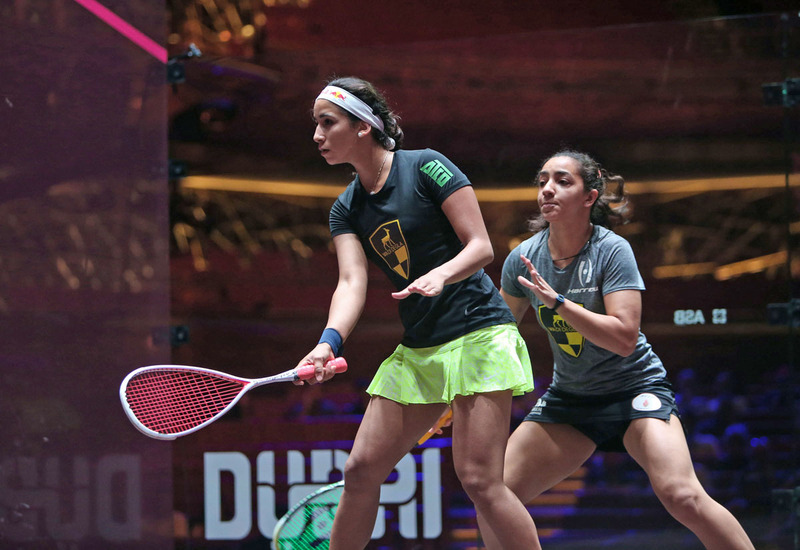 Nour El Sherbini sits in second place in Group A after she claimed an eighth successive win over David, meaning that the Malaysian misses out on a place in the semi-finals for the first time in her glittering career. 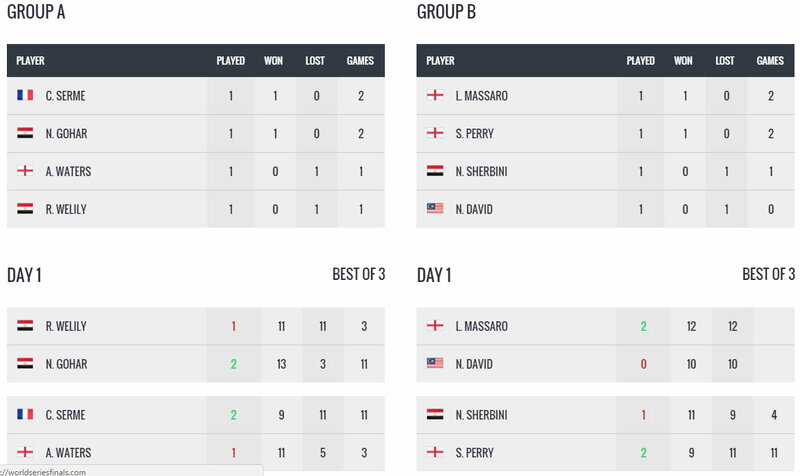 A 2-0 win over Massaro for El Sherbini in her final group fixture will see her top the group, while a 2-1 win could also see her qualify ahead of Perry depending on how she does in her match with David. French World No.3 Camille Serme made it two wins out of two to top Group B, with World Junior Champion Nouran Gohar going down in a 2-1 thriller to leave Serme on the cusp of qualification for the last four. “I’m very happy, I saw myself winning, then losing, then winning again, so anything could have happened,” said Serme. “I guess we’ll know more about what’s going to happen after the second group match, but it’s already better than last year, last year I only won one match, so it’s positive and I’m going to give it everything tomorrow." 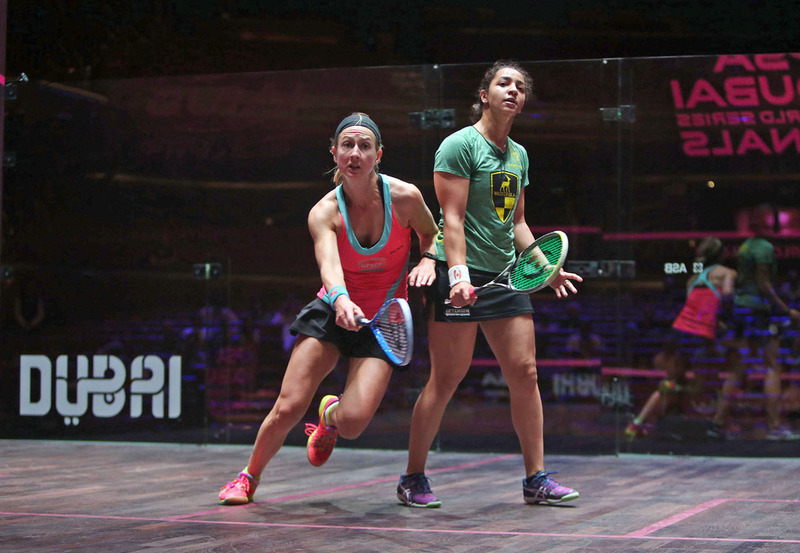 Victory for Serme over World Championship runner-up Raneem El Welily will guarantee her a place in the semi-finals, but it’s all to play for as a defeat could allow any two of El Welily, Gohar or England’s Alison Waters to qualify. 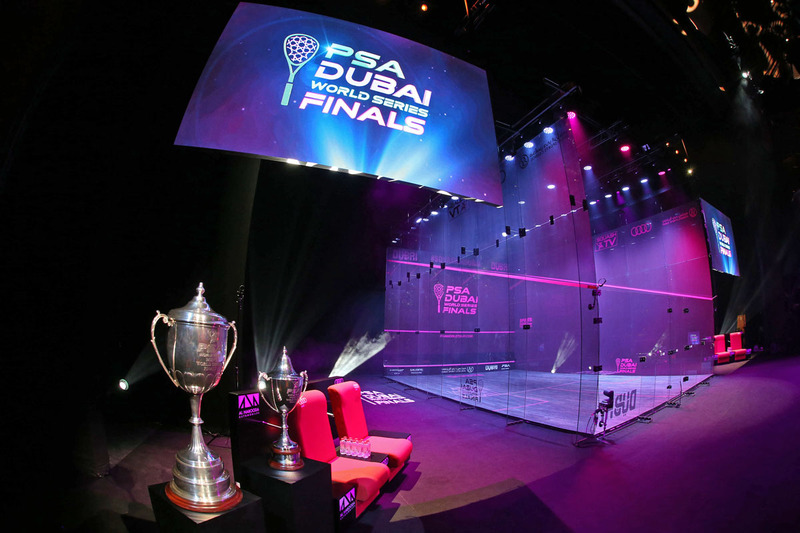 The opening day of the 2016/17 PSA Dubai World Series Finals featured a number of matches befitting of Dubai Opera’s status as one of the most stunning squash venues of all time as World Champions Karim Abdel Gawad and Nour El Sherbini both fell to shock defeats against Simon Rösner and Sarah-Jane Perry, respectively. 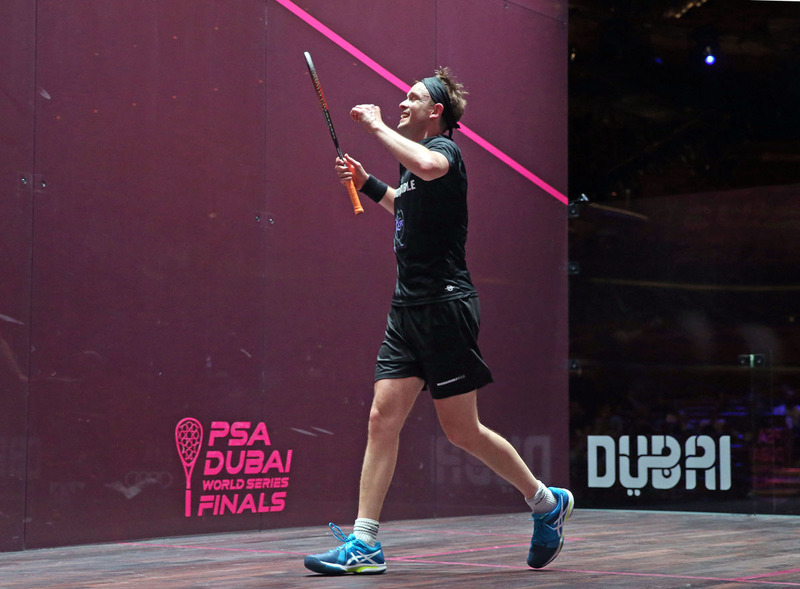 The World Series Finals brings together the top eight players on the Men’s and Women’s PSA Road to Dubai Standings, who are then split into two groups of four as they battle for points to qualify for the knockout semi-finals and beyond. 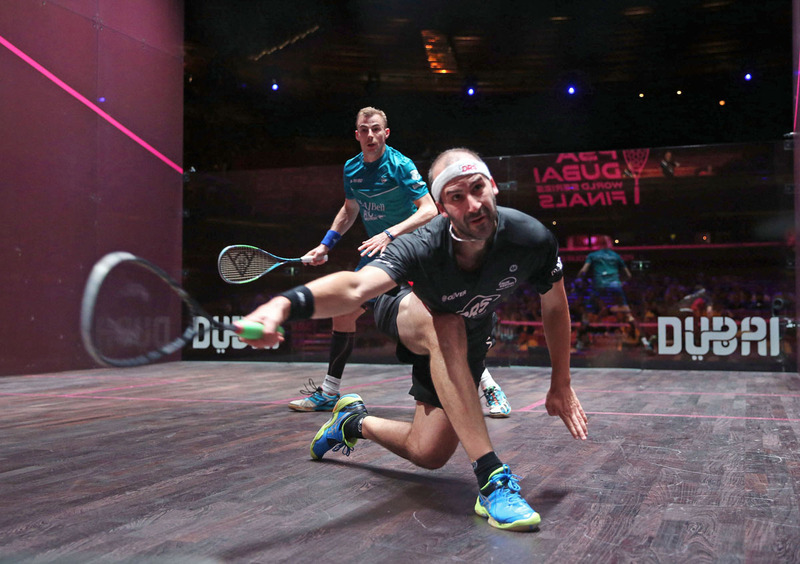 Rösner had never beaten Gawad on the PSA World Tour prior to the tournament, but the best-of-three games format – which is used in place of the normal best-of-five games scoring up until the final – looked to play into the German’s hands as he claimed an impressive 11-9, 8-11, 11-7 victory in 48 minutes. 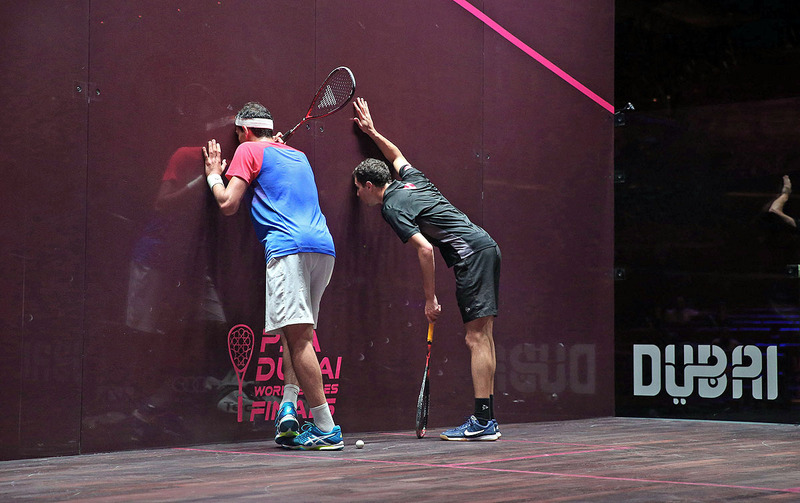 “We played some incredible squash today, I thought I managed to play aggressively and at the same time I didn’t make too many errors, which really helped,” said Rösner. “Even though I was down a few times, I didn’t let it go, I just tried to hang in there and made it as tough as I could for him. I think that the key was the aggressive game plan, but I also kept the error count really low. 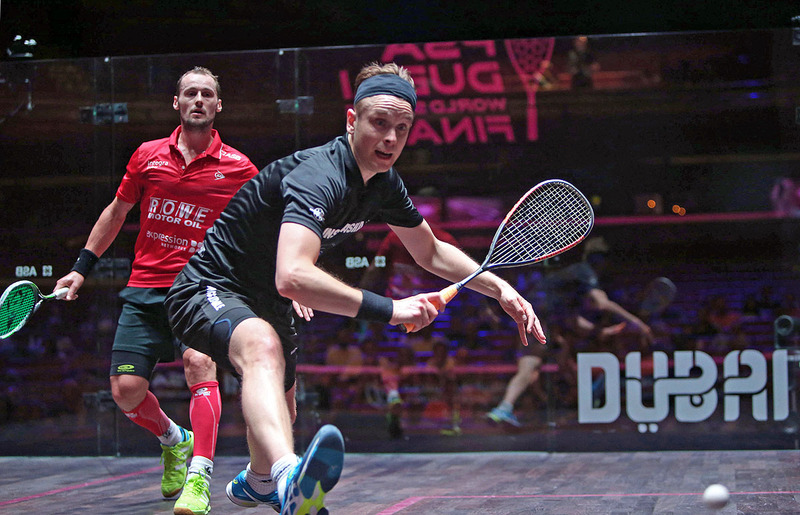 Rösner sits at the top of Group A along with Marwan ElShorbagy, who recovered from a game down to defeat three-time World Champion Nick Matthew. 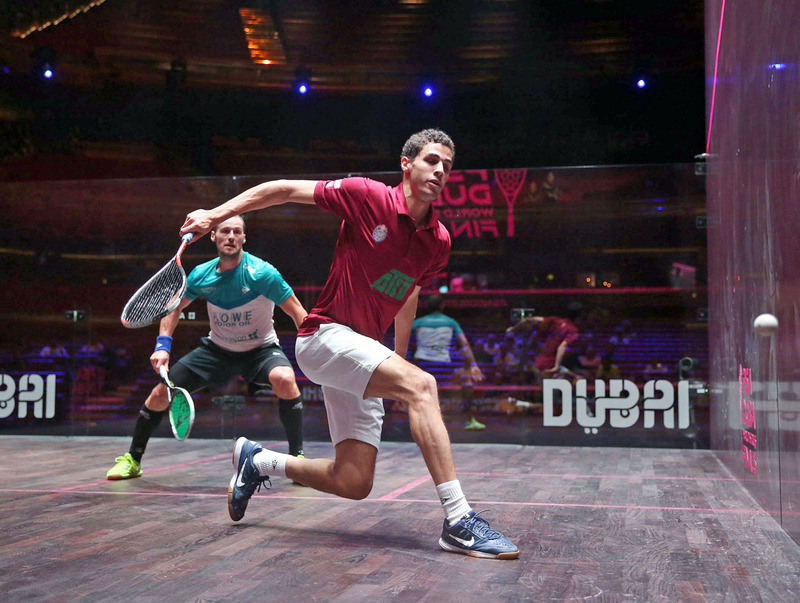 Group B was lit up by a masterclass from World No.5 Ali Farag who ended World No.1 Gregory Gaultier’s incredible 27-match unbeaten run by winning in straight games. 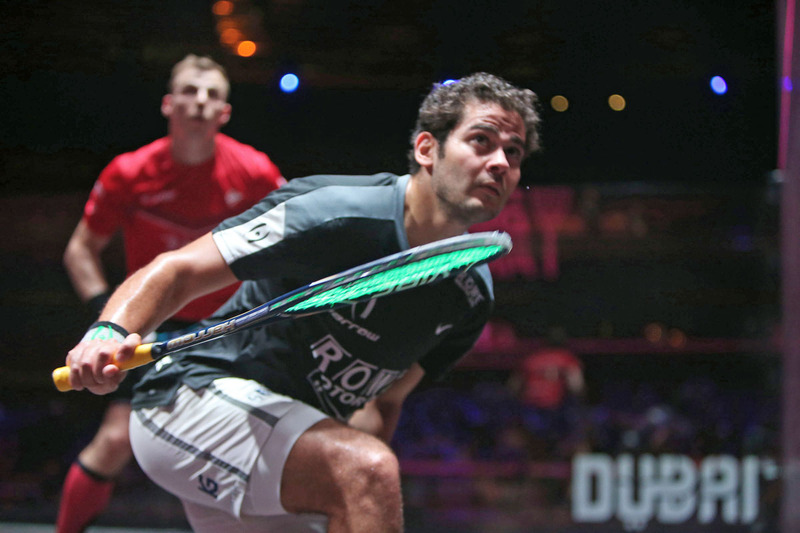 Defending champion Gaultier had lost just once in 2017, claiming six titles in a row, which included victories over Farag in the finals of the Grasshopper Cup and Bellevue Classic. 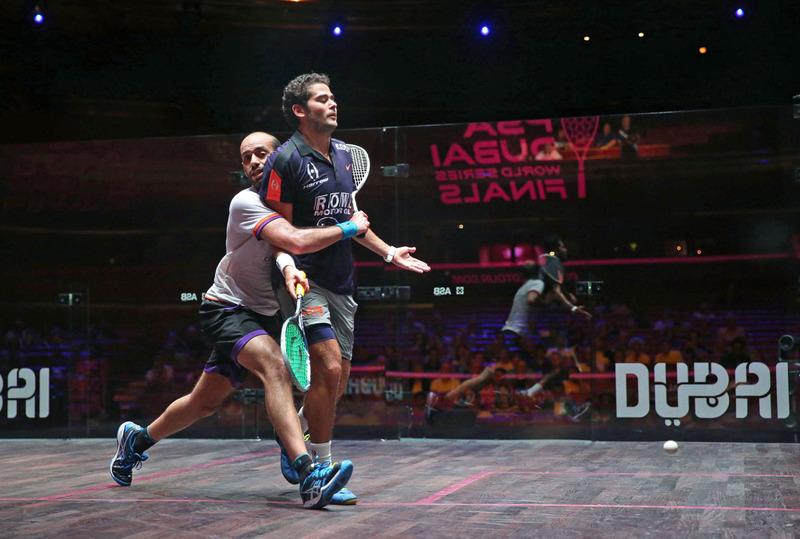 However, a superb display from Farag against an admittedly out-of-sorts Gaultier saw the 25-year-old dominate the Frenchman in a way that few have managed over the past six months to claim a huge win. 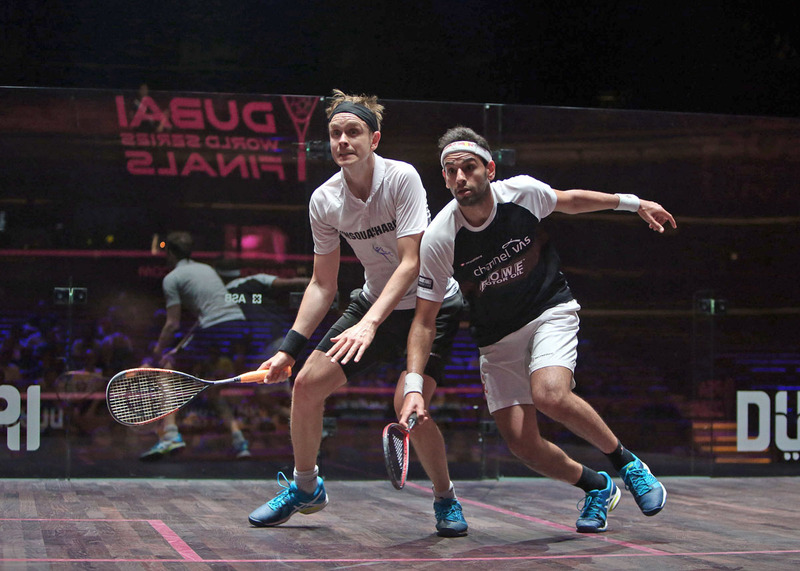 “The last two times I didn’t even take one game, so to win today in two games was surprising to even myself,” said Farag, who was making his World Series Finals debut. “I think I played very well and towards the end I was very edgy because I was 10-6 up in Seattle against him. When he lets loose he plays even better, so I was always on my toes and I’m very happy to win in two today. 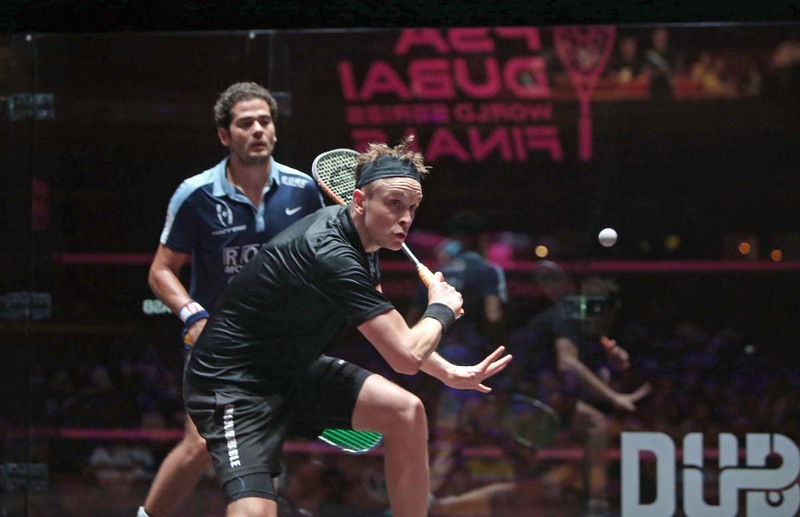 Gaultier will take on former World No.1 James Willstrop next, who lost out to World No.3 Mohamed ElShorbagy. 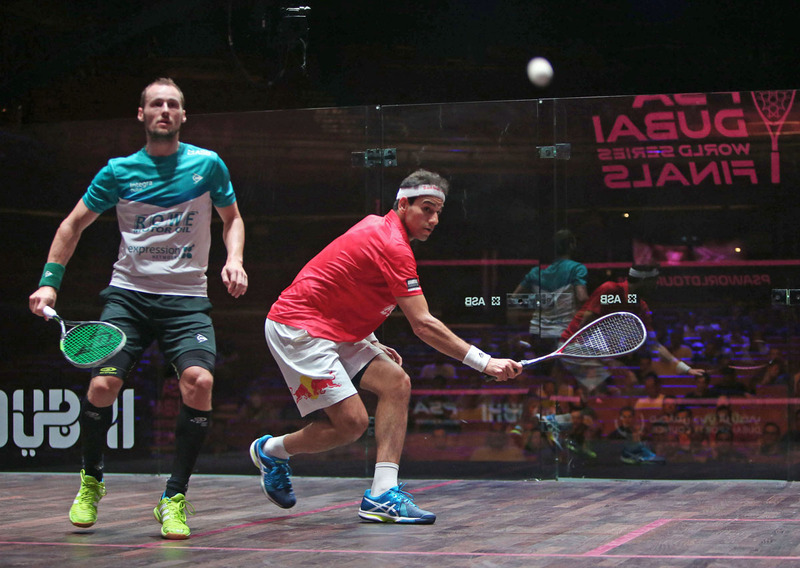 Farag will take on ElShorbagy as both players look to take a step closer to qualification from Group B. 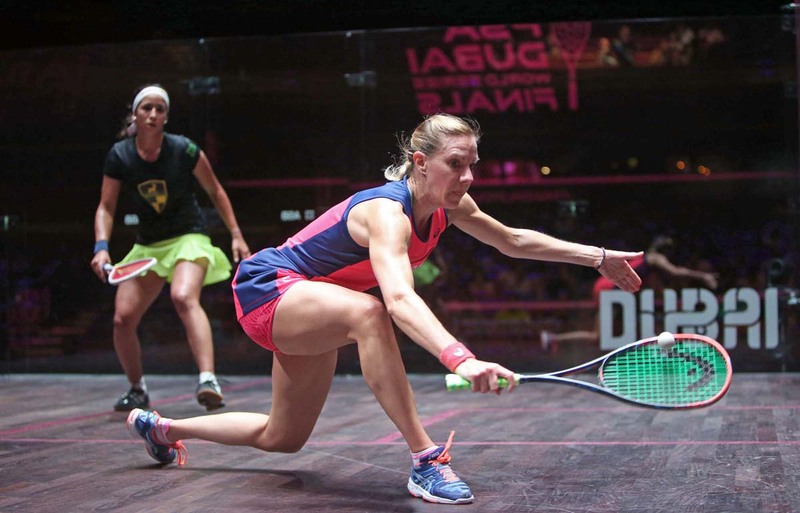 The Women’s event saw World No.7 Perry claim her first ever win over El Sherbini at the fifth attempt, with a superlative performance from the 27-year-old seeing her fightback from a game down. El Sherbini took the opener, but Perry – who qualified for the World Series Finals after the greatest season of her career saw her reach the final of the British Open three months ago – refused to be beaten and she came out fighting, taking the next two games to leave El Sherbini needing a win in her next match with Malaysia’s Nicol David. 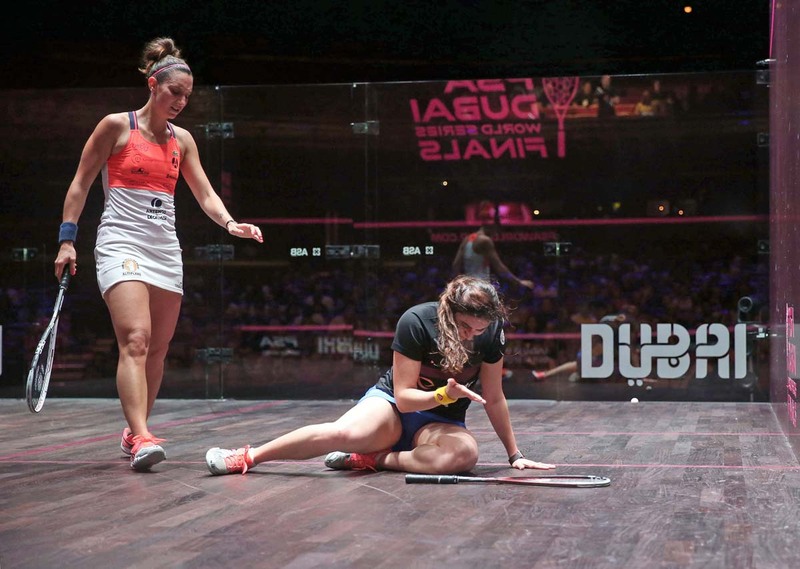 “I’m feeling pretty amazing, I think this is the first time I’ve beaten Nour, but it’s also the first time that I’ve beaten the current World No.1,” Perry said. 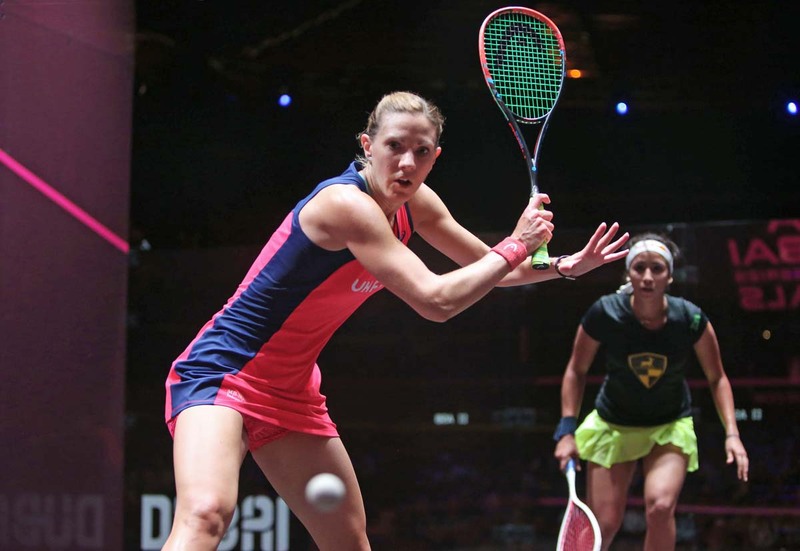 Defending champion Laura Massaro also won on day one against eight-time World Champion David in the latest chapter of their rivalry on the PSA World Tour. 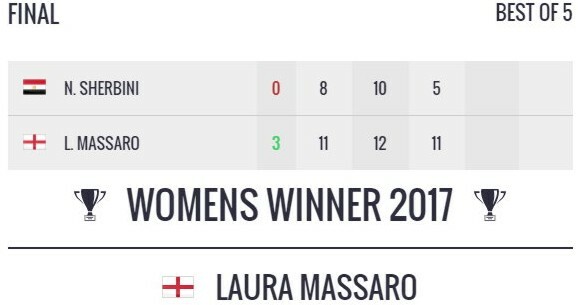 The match started tentatively, with both players struggling to find their lines and making errors, but it soon developed into a free-flowing affair, with Massaro fighting back from three game balls down to take the first game by a 12-10 margin and she claimed the second game by the same scoreline to move to the top of Group B. 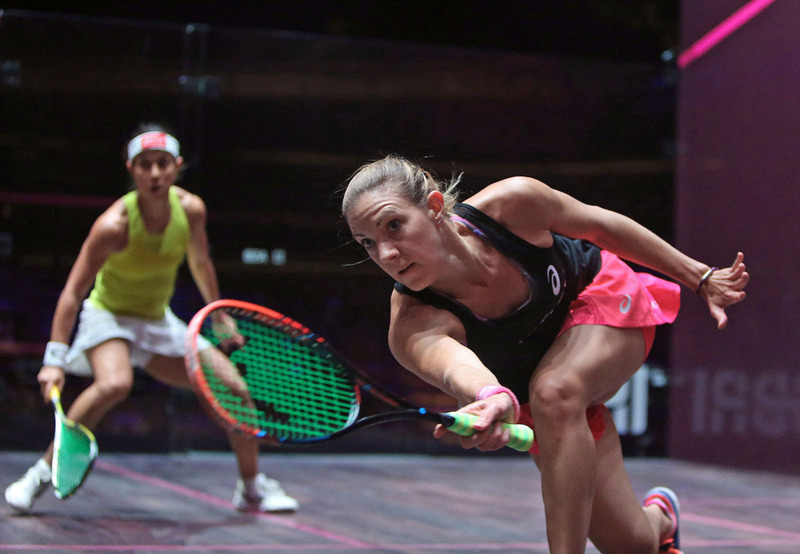 “I didn’t realise no one else had dropped a game, it was tight and in that second game when I was in front I was thinking that I would be gutted if I lost that one and it went to three,” said Massaro, who takes on Perry next. 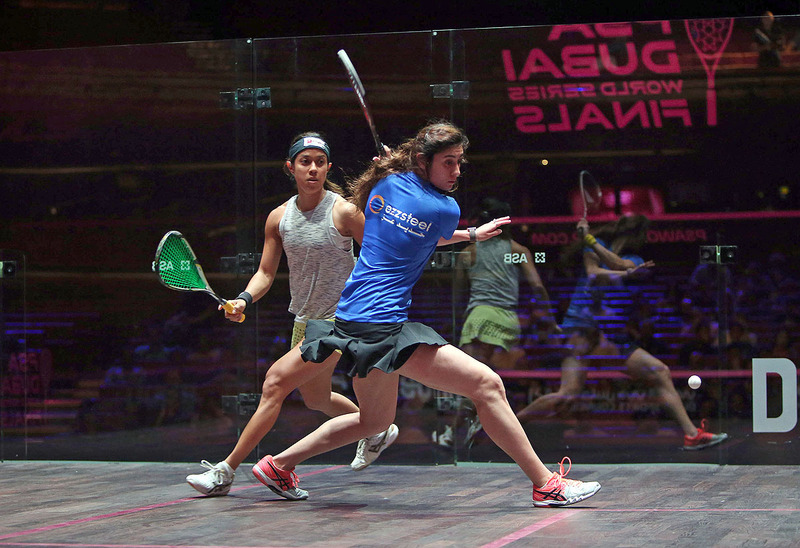 Group A saw top seed Camille Serme recover from a game down against England’s Alison Waters, while World Junior Champion Nouran Gohar defeated World No.2 Raneem El Welily. 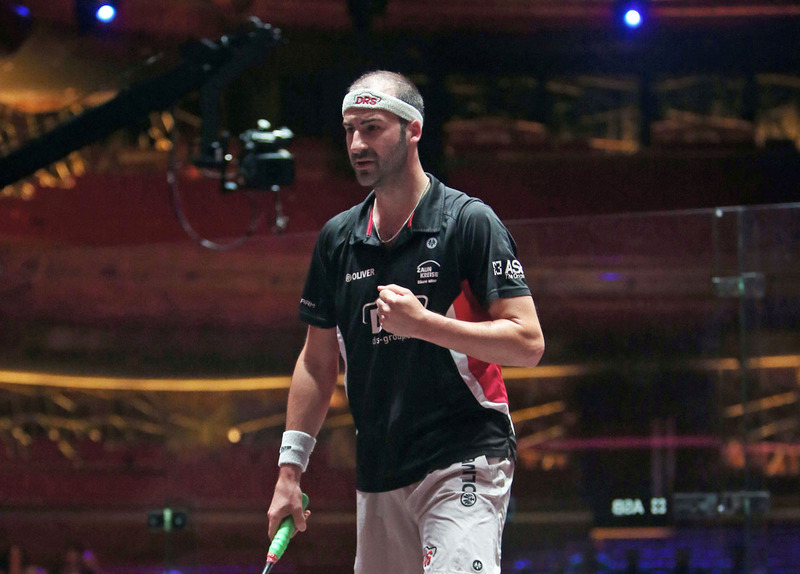 Live coverage from day two of the World Series Finals begins at 15:00 local time (GMT+4) and will be shown on SQUASHTV (rest of world) and Eurosport Player (Europe only). 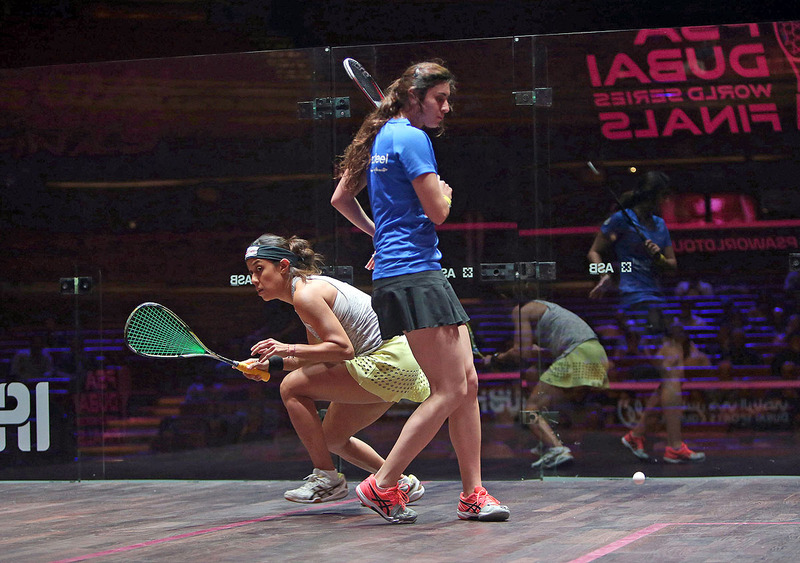 World No.5 Nouran Gohar says she is determined to put nerves to one side and improve on last year’s disappointing performance when the 2016/17 PSA Dubai World Series Finals gets under way between June 6 – 10 at Dubai Opera. 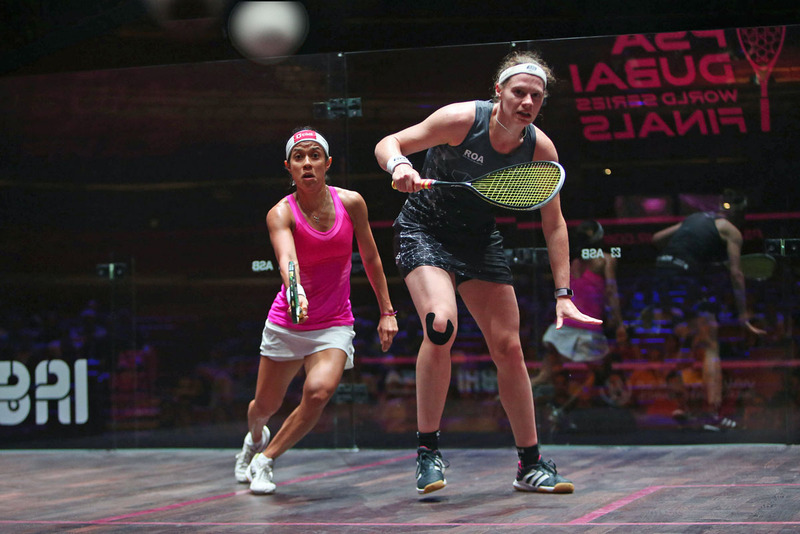 The 19-year-old – who qualified fifth on this season's PSA Road to Dubai Standings – went out at the group stage last season in what was her first ever appearance at the tournament, which brings only the top eight players together to compete for one of the sport's most sought after titles. 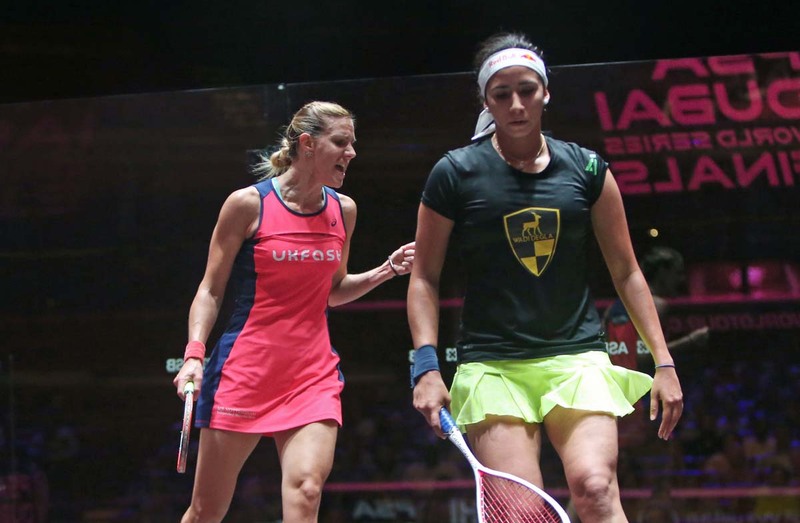 But the Egyptian, who claimed her first ever World Series title at the 2016 Hong Kong Open, is keen to learn from her experience and go further at the end-of-season finale this time around. “I am so excited to be back at the biggest event of the year," said Gohar. "All through the season players were battling in all the World Series tournaments just to get the opportunity to play in the World Series Finals. I am really happy that I was able to qualify again and I’m looking forward to playing there. “Making it last year was huge for me and to be honest I did not expect it. It was a totally new experience for me. "I was too excited to be there and I didn’t quite manage to play freely without nerves or pressure. It was great to be among the top eight players in the world but I think I could have dealt with the situation in a better way. "I still enjoyed the event a lot, everything was simply perfect - apart from the results." 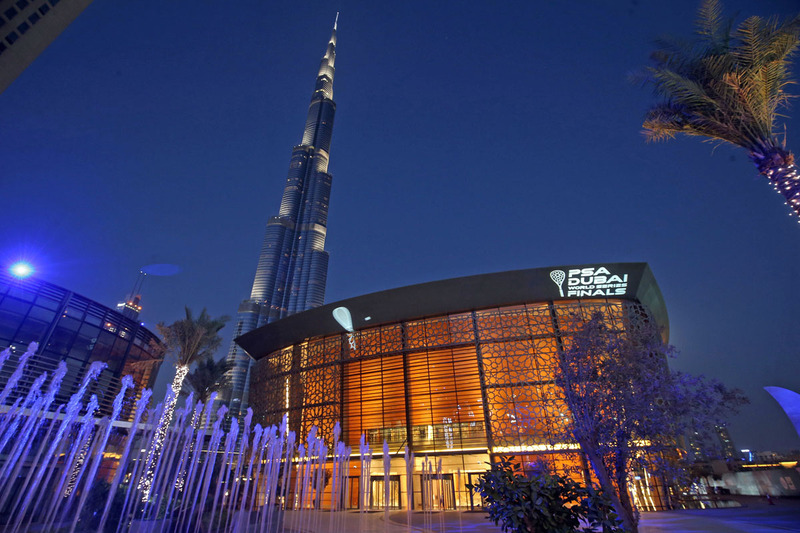 This year’s tournament takes place at the Dubai Opera and Gohar can’t wait for the action to take place at the iconic venue. “I was amazed by the pictures of the Opera when I saw them," she added. 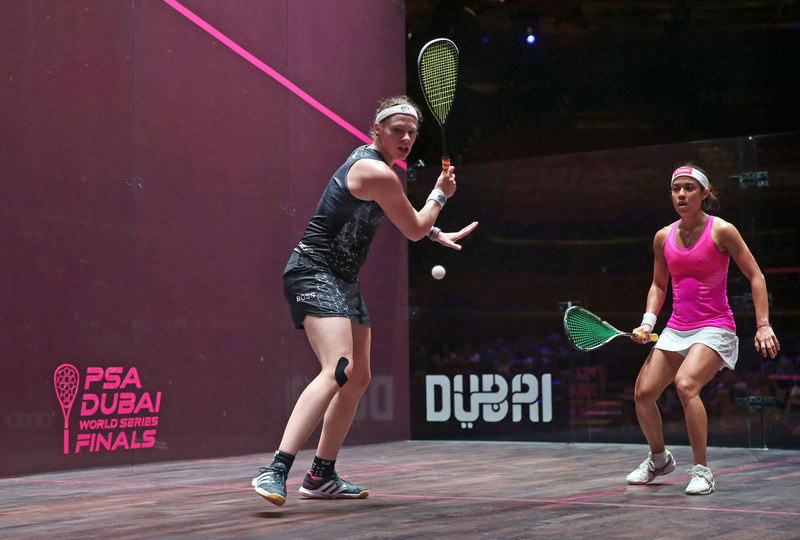 Gohar will go up against World No.3 Camille Serme – who topped the Road to Dubai Standings, World No.2 Raneem El Welily and World No.9 Alison Waters in Group A. 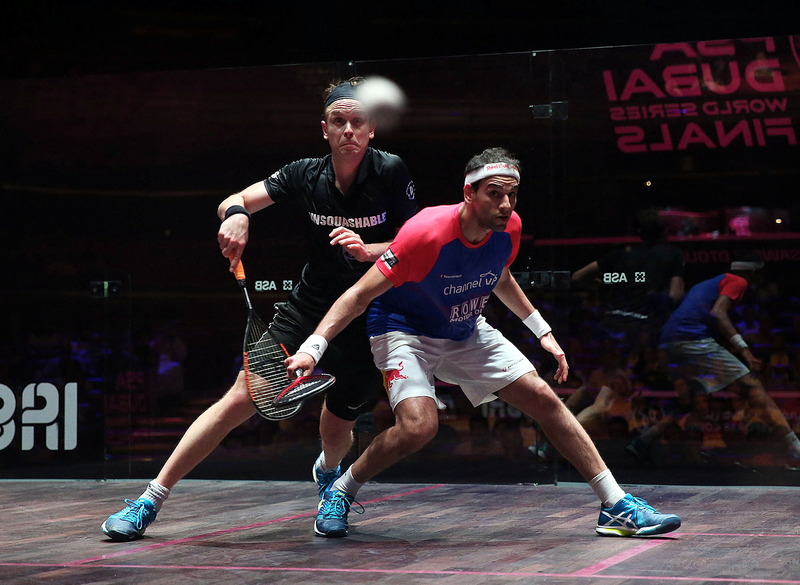 And with the World Series Finals featuring a round-robin best-of-three series for a place in the knockout semi-finals and beyond, the young Egyptian admitted there is no room for error. “It is a big difference to play in a best of three format. "You have to be on your toes and very well prepared from the very first rally. You can’t afford to lose the first game easily against a top eight player. 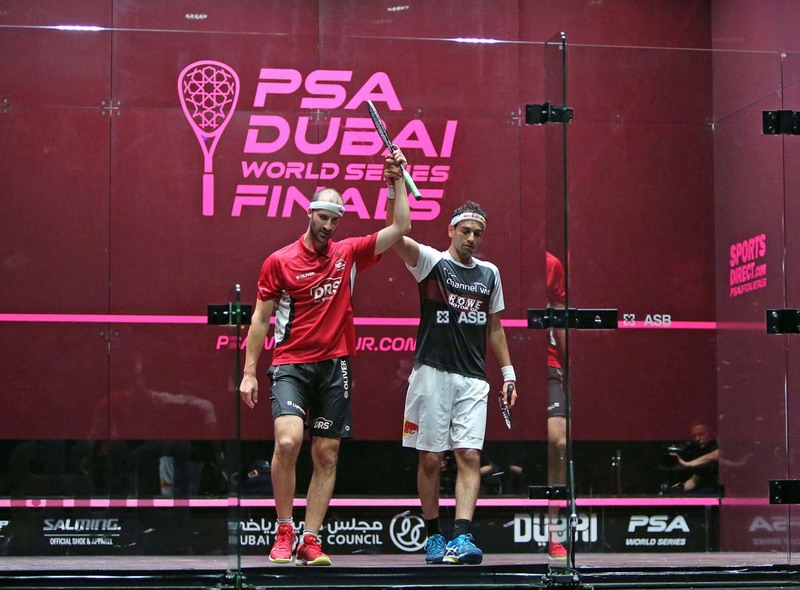 The PSA Dubai World Series Finals takes place from June 6-10, 2017 with all of the action to be shown live on SQUASHTV (rest of world) and Eurosport Player (Europe only). 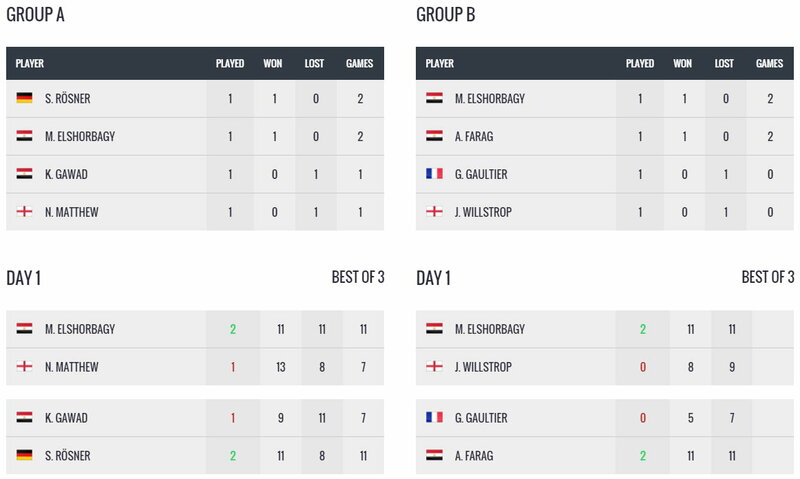 Group stage matches will take place at 3:00pm, 3:45pm, 16:45pm and 17:30pm (Group A) and 21:30pm, 22:15pm, 23:15pm and 00:00am (Group B) between June 6-8 with the semi-finals due to take place from 22:00pm on June 9. The finals will commence at 22:00pm local time on June 10. 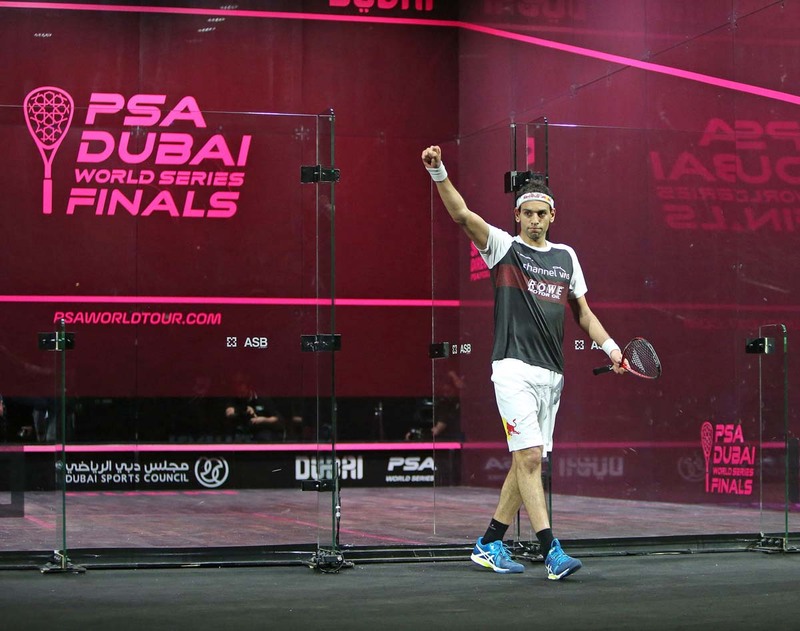 Defending champion Gregory Gaultier, the French World No.1 who has gone 27 matches and six consecutive tournaments undefeated in 2017, will take on Egyptian World No.5 Ali Farag - a late replacement for the injured Ramy Ashour - in the final match on the opening day of action at the season-ending PSA Dubai World Series Finals on June 6. 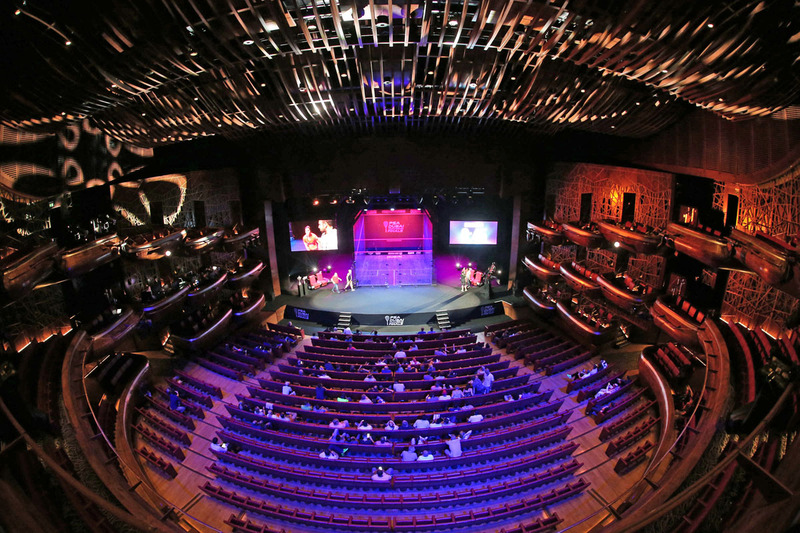 Inside Dubai Opera, the duo will meet for the third time in three events, after contesting both the Grasshoper Cup and PMI Bellevue Classic finals, in what will be the climax to a day of competition that will also see fierce rivals Laura Massaro, 2013 Women's World Champion and defending Women's World Series Finals champion, and Nicol David, eight-time Women's World Champion, go up against each other for the 31st time in their careers. 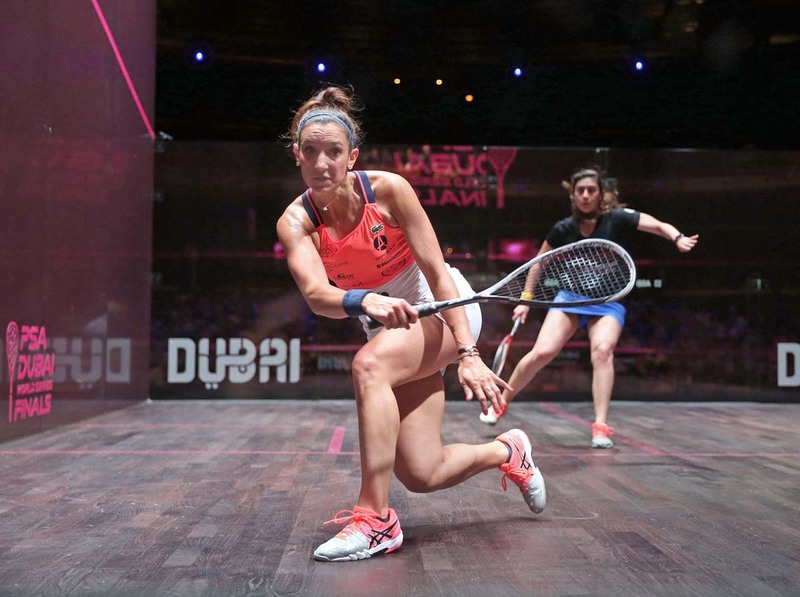 The action gets underway at 15:00 when last season's Women’s runner-up and former World No.1 Raneem El Welily of Egypt takes on compatriot Nouran Gohar, the 19-year-old who won the Hong Kong Open in August, before England's former World No.1 Nick Matthew begins his quest for one of the few trophies to have eluded him during a glittering career to date as he goes up against debutant Marwan ElShorbagy of Egypt. 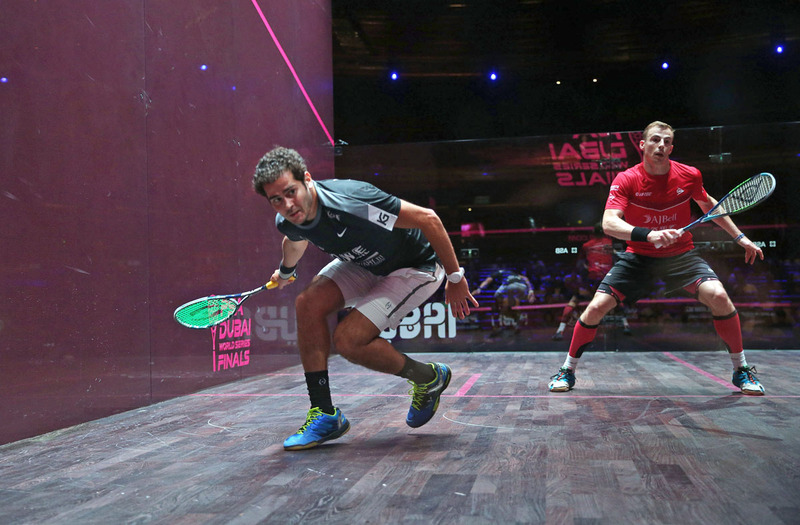 The two players who topped the PSA Road to Dubai Standing also make their first appearance in the afternoon session, with France’s Camille Serme playing England’s Alison Waters and World Champion Karim Abdel Gawad, who will be making his debut at the tournament, facing Germany’s Simon Rösner in a match that could prove vital for both men's hopes of advancing to the latter stages. 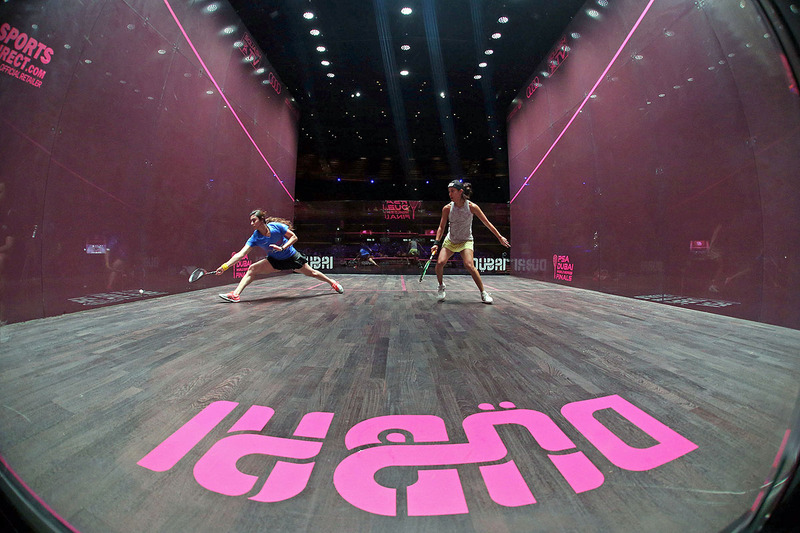 With eight matches, split across two sessions, the opening day will also see former World No.1s Mohamed ElShorbagy and James Willstrop lock horns before Women’s World Champion and current World No.1 Nour El Sherbini faces England’s Sarah-Jane Perry. 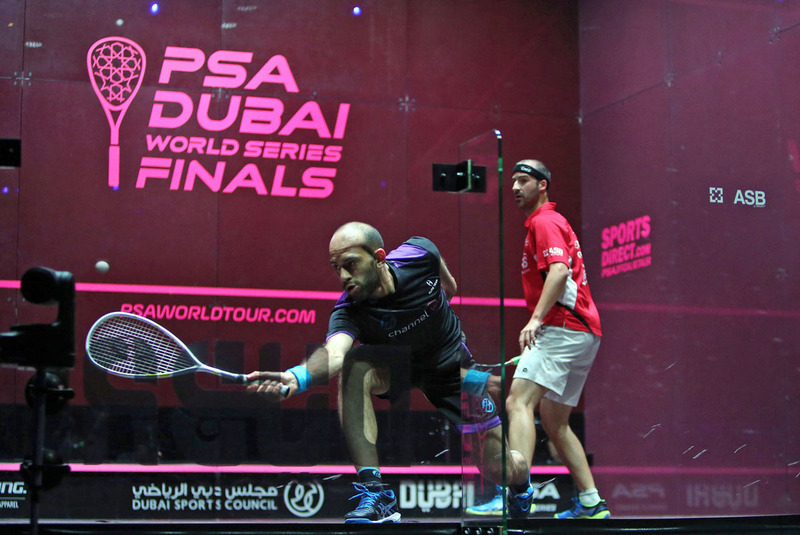 The World Series Finals sees the top eight players on the Men's and Women's PSA Road To Dubai Standings compete in two groups of four in a round-robin best of three format, with only two players from each group progressing to the knock-out semi-finals. 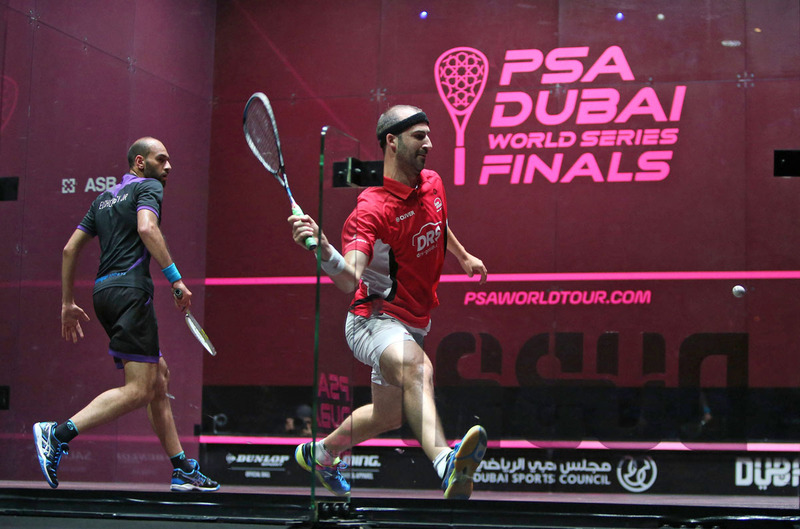 The Professional Squash Association (PSA) have announced that a reduction in the amount of time that players have to warm-up the ball up on court at the start of matches will be trialled at the upcoming PSA Dubai World Series Finals, while there will be an increase in the time given to players between games. 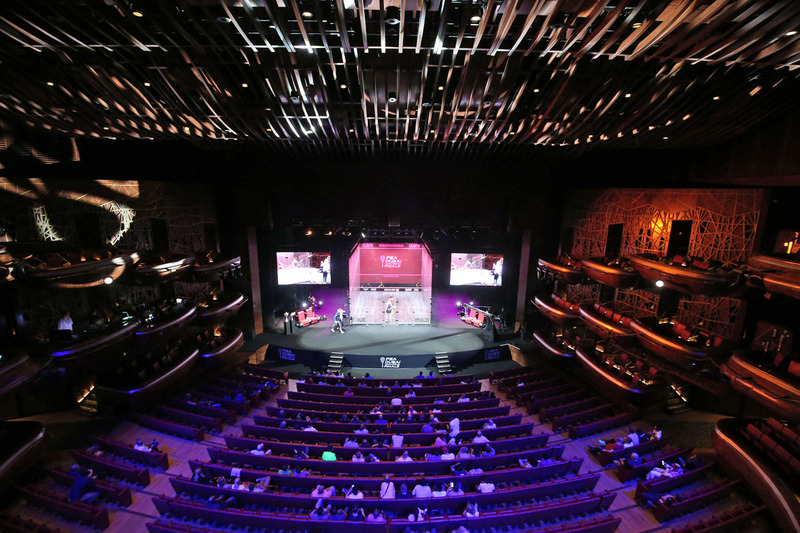 Taking place in Dubai Opera between June 6-10, the World Series Finals will see the warm-up period reduced from five minutes to three minutes after which point players will be given 90 seconds in which to prepare for the start of play. Meanwhile, the time allowed between games has been increased from two minutes to two minutes and 30 seconds at which point play must begin immediately. A countdown clock will be visible for both players and spectators in addition to announcements from the referee to inform players as to how much time they have left. Players not in a position to either serve or return a serve after the interval is up will receive a time violation, with the potential of penalty points being awarded against them for further time violations. 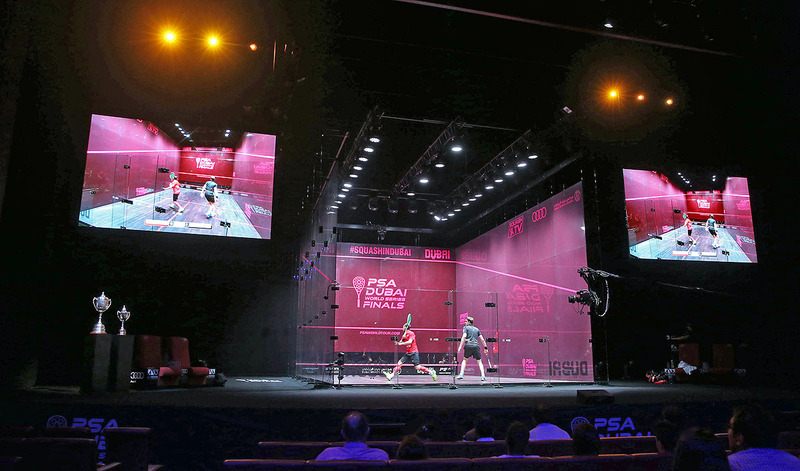 "Squash is a vibrant and dynamic sport and we feel that altering the time taken during the warm-up period and game intervals will improve the flow of the matches for spectators and TV audiences," said PSA Chief Operating Officer Lee Beachill. 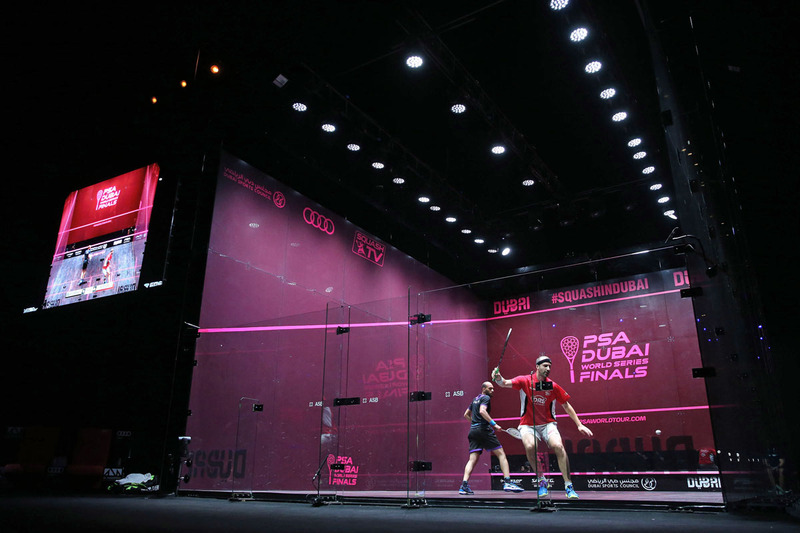 "We believe that this trial period will be an important step into further increasing the sport’s visual appeal and look forward to witnessing the effects of the trial during what promises to be a world-class week of squash in Dubai."